You’d be surprised the things that collect over 60 years of continuous operation from our one location in Downtown Barrie Ontario. The recesses of our safes have many oddities that have been squirreled away over the decades. Gemstones common and unusual, small and large, diamonds of every shape, description, and age. We keep the smaller gems and diamonds for repair and refurbishment purposes, or for use in custom orders. Lately we’ve been trying to find new life for some of the larger or more interesting of the lot; things that most customer’s wouldn’t think to inquire about. We want to make these items more accessible by having them ready to go in live pieces of jewellery. This 0.48 carat oval brilliant cut diamond is one of that lot. We rediscovered it while searching for an oval center for another custom made engagement ring custom. It didn’t fit the parameters for that order but at SI2-I1-IJ quality we found it too interesting and lively to pass up. 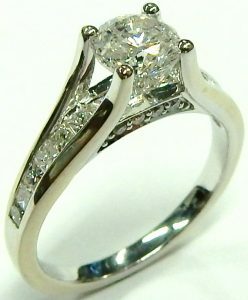 We set it into a brand new 2 gram halo style American made 14 karat white gold setting (size 7). We chose to match the 0.33 carats of accent diamond to the center with an I1-HI quality. Estate price for this brand new engagement ring with an estate centre diamond is only $1,820.00 CAD and represents true value that few could match. Stock #e11986. Ben Moss Jewellers has been resurrected by Canadian company Charm Diamond Centers. The East Coast based Canadian jewellery chain bought the rights to the Ben Moss brand just after it folded a few years ago. Ben Moss stores are once again popping up across the country. This particular Ben Moss engagement ring was part of their original product line and is of their higher quality. 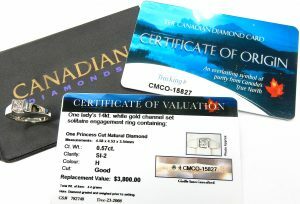 The 0.57 carat certified Canadian princess cut diamond is of SI2-I quality (H according to its certificate) and bares a unique laser engraved inscription as proof of Canadian origin. The 14 karat white gold bar set ring doesn’t exhibit any of the hollowing out that you normally find in mass produced jewellery. It weighs a sturdy 4.2 grams and measures a finger size 6 3/4. As is often the case with certificates that accompany a piece, this certificate states a replacement value of $3,800.00 CAD. We feel a more realistic competitive replacement value is $2,000.00. As a like new estate piece we have it priced at just $1,200.00 representing excellent value. Stock #e11996. Platinum enthusiasts should find palladium an interesting alternative to their favorite ever-white metal of choice. This platinum cousin has a couple of appealing benefits over its more famous counterpart. The first is that palladium is only half as dense as platinum, meaning that despite its higher market value it often ends up being less expensive. The first step of pricing a piece of jewellery is its gram weight. Two identical rings cast in different materials will have two different gram weights based on their metal density. So a pair of identical palladium and platinum rings will have two very different gram weights and thus different prices. Despite that reduced density, palladium is actually harder and stronger than platinum, making it slightly more durable. It shares the same platinum white finish and resistance to being worn away over time. The metal is an ideal choice for an eternity band like this one. As you can see from the images there is a great deal of open space which in a softer metal could cause the ring to deform over time. 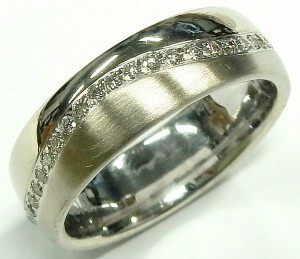 In palladium the 5 1/2 size ring will hold up much better to daily wear. Even with all of that open space the 0.86 carats of SI-H quality are well supported under protective channels. Each of the 27 round brilliant cut diamonds have been deeply seated into a a high polished solid backing, looking at a glance to be floating between the two edges. Estate price for this surprisingly sturdy 1.4 gram ring only $1,386.00 CAD. Stock #e11964. Basic solitaires are always attractive and always in style. Round, oval, pear, marquise, heart shaped or square, they all look great in this most basic of engagement ring styles. 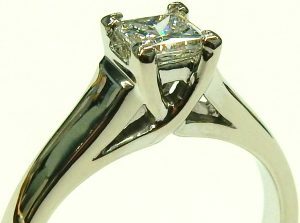 The V shaped claws in this example help protect the corners while making the 0.74 carat princess cut diamond look a little bit larger. The diamond measures an almost perfectly square 4.9mm x 4.9mm. Optically it is pretty nice with a strong SI1 clarity, K colour and very good cut. A small table and generous crown height are features not often encountered in square brilliant cut diamonds but they really contribute extra brilliance and dispersion. Measuring a slightly larger than average size 8 this ring can be further adjusted up or down to fit almost anyone. The 14 karat white gold ring weighs 3.0 grams and will fit any flat edged wedding or anniversary ring you may already have. It’s a versatile design in like new condition. Estate priced at $1,750.00 CAD. Stock #e10761. Sleek and sturdy the bar set engagement ring is a unique take on the diamond solitaire. The gently sloping 5mm wide shoulders make a calm contrast to the brilliance of the 0.57 carat diamond they press against. That modern airy setting allows a fuller view of the iconic profile of the classic round brilliant cut. Appropriate as this is a well cut example, disguising its I1-G quality grade in a show of white flashes and spectral rainbow light. The lively diamond is set extra low making it more than appropriate for the not so delicate bride-to-be. Thanks to its flat edges and understated design the 14 karat white gold solitaire can be paired with any band or combination of bands; working equally well with a traditional band or the mix and matched stacked look. Currently a rather tiny finger size 4 1/2 but it can be adjusted at least a few sizes larger by one of our onsite goldsmiths. Estate price $1,380.00 CAD. Stock #e11933. Diamond detective is a role we are some times called upon to play when dealing with estate diamonds. In this instance we were investigating the unusual purple hue of this diamond. 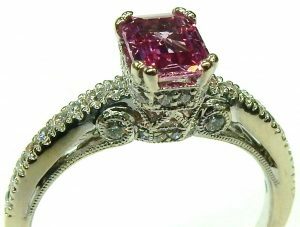 It might surprise you to know that purple diamonds can occur naturally though it is extremely rarely. The colour of this diamond is in line with the tone that some natural purples form in but this example is not natural. If you read our posts regularly you may remember how some low transparency diamonds can undergo a treatment known as clarity enhancement. 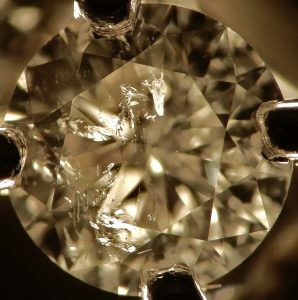 When feather inclusions inside of a diamond reach the surface their appearance can be diminished by infusing a molten glass like substance into the fissure(s). The glass material has a similar refractive index to diamond helping it mimic diamond optics. Think of it like ice cubes in a glass of water. The ice cubes are very white looking and full of little white fracture lines when you pop them out of the tray. But when you drop them into liquid water (which of course has a very similar refractive index to ice) the water fills those fractures and the ice cubes almost disappear. The glass acts as the water, filling those fissures and making them almost disappear in the diamond. Effective and permanent so long as the diamond is not subjected to excessive heat that can melt out the filler. 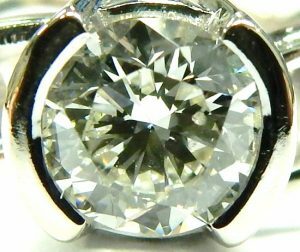 This diamond ring may have been exposed to a jewellers torch for sizing or some other alteration as the clarity is a little lower than the SI2-I1 clarity you would typically expect to see in a post clarity enhanced diamond. You must always make your goldsmith aware of the treatment before having any repair work done which requires a jeweller’s torch. The 1.00 carat round brilliant cut is pleasant and an easy I2 clarity, “I” colour, with strong blue fluorescence. The diamond is very lively despite its promotional quality. Especially due to the evenly distributed purple colour caused by the filler agent, helping to distract from its inclusions. That unusual violet tint makes you look twice, thinking your eyes must be playing tricks. The unusual diamond is proudly set into a solid 4.1 gram 14 karat white gold solitaire mounting, a timeless choice. It’s a very impressive 1.00 carat diamond considering the estate price of only $1,610.00 CAD. Stock #e11899. The most desirable colour of blue sapphire as far as the industry is concerned is cornflower blue. The lighter tone helps show off the natural brilliance of sapphire that gets lost in the inkier deep blues. The cushion shaped 0.80 carat cornflower blue sapphire at the center of this antique ring is of fine quality and you don’t need to be a gemologist to see that. 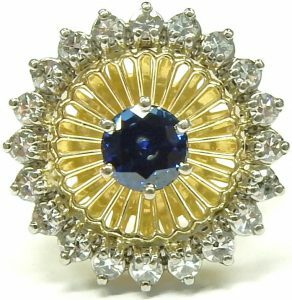 A fun coincidence that the cornflower sapphire should be the adorning jewel of this flower ring! The platinum petals are set with 0.40 carats of antique old European cut diamonds two of which have been chipped on the crown. The angular bright cut engraving around each diamond adds to the overall brilliance of the 14.5mm bloom. 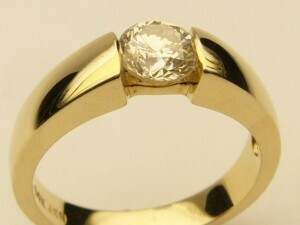 The ring is finished with a 14kt yellow gold shank with open shoulders. Currently measuring a finger size 6 1/4 with room to adjust. Estate price $1,715.00 CAD. Stock #e11939. There’s no doubt about it, round diamonds just look the best if sparkle is the priority. Even in modest qualities round diamonds are simply more optically efficient than any other shape. When well cut they reflect a lot more light back to your eyes. If you set them side by side though what do you do with the open area? Well, you just set more diamonds there. This Canadian made anniversary/dinner ring displays great sparkle in every area. The manufacturer has cleverly set some tiny round brilliant cut diamonds under the large stones within the channels. The result in an uninterrupted display of brilliance and dispersion. The diamonds are set so closely together I think you wouldn’t even know the small diamonds are there unless someone told you. Our simple photographs can’t begin to show how nice this ring looks in traditional 14 karat yellow gold. 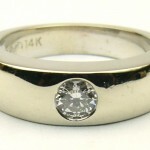 The 4.0 gram, size 7 1/2 ring can be adjusted in size by one of our goldsmiths as required. The diamonds weigh a combined estimated total weight of 1.00 carat and face up much better than the I1-IJ grade would suggest. The ring is estate priced at $1,155.00 CAD. Stock #e10857. The dome ring just happens to be the first ring that most jewellery students learn to carve. It trains their eye for symmetry as the ring is curved across all of its sides. Each student must achieve an even curve from every angle while also keeping both halves of the ring in exact mirror proportions to each other. As the human eye can notice differences of 1/10th of a millimeter there can’t be even the slightest bulging anywhere on the rings surface. This ring from Links of London’s Dome line represents thousands of hours of combined work among budding jewellers. Being Links of London the ring goes beyond the classic dome adding a fun pierced undergallery as a hidden detail for the wearer’s eye’s only. 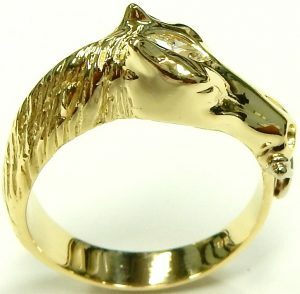 Weighing in at a hefty 19.6 grams of high quality rich 18 karat yellow gold the ring measures a finger size 7 3/4. In link new condition showing only minor signs of occasional wear. Estate price $1,600.00 CAD. Stock #e9866. 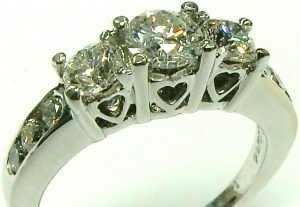 A three diamond ring with a past, present, future, symbolism is a timeless option for an anniversary or engagement ring. This particular one is made even more timeless consisting of both 14 karat white and yellow gold in the classic double gallery four prong setting style. The wide flat 3.4mm band weighs 3.6 grams and should be durable enough to last a lifetime. It features three shining I1-J round brilliant cut diamonds for a total estimated weight of 0.87 carats that will always remind her of where you’ve been together, and where you are going. Currently a finger size 5 1/4 the ring can easily be sized up or down. 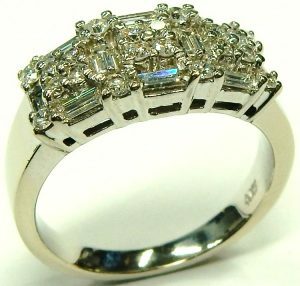 It’s a lot of ring and an outstanding value for the estate price of $1,380.00 CAD. Stock #e9697. With all the false discounts promising savings of 70% off and more, you have to wonder what kind of margins these stores have in the first place. At Bill Le Boeuf Jewellers we treat our customers with the respect they deserve. We offer our best value every day on new and estate items like this. We offer full disclosure with all our offerings posted online so it makes comparison very easy (assuming the others even tell you the component details). 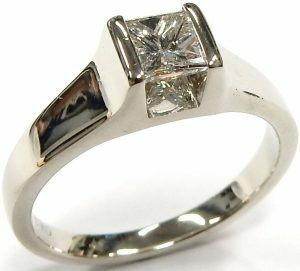 This ring for example contains 9 square princess cut diamonds of well matched SI1-IJ quality. They are channel set in a simple 4.6mm wide 14 karat yellow gold flat ring weighing 3.4 grams. If this was a new ring our regular competitive estimate of replacement value would be $1,600.00. As a like new estate item it is priced at $1,120.00 CAD and represents perhaps the best available value around. That’s what Bill Le Boeuf Jewellers is all about, providing our customers the best value for well over 1/2 a century. Do some homework, shop around, get ALL the details and then come see what we can do for you. Our slogan says it all “Price is simply what you pay, VALUE is what you get”. Estate price $1,120.00 CAD. Stock #e8685. This is the first oval version of the invisible set cluster we’ve encountered in our estate department. As with the princess cut, this technique employs four custom cut, invisibly set diamonds sitting girdle to girdle, making the appearance of one larger diamond. The technique is very effective and certainly gives the desired impression, especially surrounded with a brilliant halo of diamonds. Combined with the diamonds that decorate the under gallery and shoulders, the ring is set with 0.66 carats of good quality SI-H diamonds. On top of all of that bling the ring has been decorated with delicate millgrain and open wire work. 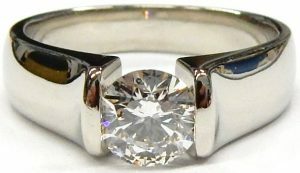 The 5.5 gram ring is made from 14 karat white gold and measures a finger size 5 1/2 with a little room to size up only. Estate price $1,200.00 CAD. Stock #e11664. It’s not the biggest diamond and it doesn’t have a setting covered in extra decoration but it can hold its own in outright beauty and quality. From the full shoulder 4.1 gram ring setting constructed from premium 18 karat yellow gold and platinum, to the 0.25 carat VS2-EF excellent cut round brilliant cut diamond. 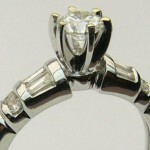 This solitaire was assembled with one thing in mind; traditional quality. The 3.4mm wide ring has a clever “reverse” knife edge shank with a sharp groove running down the centre protecting the finish from becoming easily scratched. A simple 4 prong setting made from ultra durable, ultra white platinum displays the high quality diamond at a comfortably low height. The smaller than average finger size 4.5 ring can be sized bigger if required. It’s refreshing to see such a quality piece made from the rich traditional colour of 18 karat yellow gold. Perfect condition looking like brand new. Estate priced at $1,208.00 CAD. Stock #e9134. “Branding” is the new way jewellery and retail in general is being marketed to you the consumer public. Although we do carry some brand name items, we’ve always focused on the value of our offerings, not just promoting the latest trendy brand name. Educating clients and thoroughly explaining our products are details far more important to us than a slick marketing campaign or questionable sale promotions. Glacier Fire is the house brand for Canadian retail chain Charm Diamond Centres. This example is nothing but high quality as it was manufactured using premium 18 karat white gold and contains a very nice Canadian mined diamond. The simple Lucida setting weighs 3.9 grams in its current finger size 5 3/4. It contains a beautiful 0.36 carat, SI1-G round brilliant cut diamond with an ideal cut, excellent symmetry and polish as described in the included International Gemological Institute report. The diamond ring also comes with a lovely hinged wooden box containing an “ideal scope” loupe. This little tool allows a filtered magnified view of the “hearts and arrows” pattern all excellent cut round diamonds display. The November 2005 certificate of origin declares the diamond is a product of the Northwest Territories and entirely cut and polished in British Columbia Canada. A unique registered number appears on this certificate, the accompanying appraisal and has been permanently laser engraved on the girdle of the diamond. The IGI’s idea of a replacement value as stated on the certificate of valuation is $3,250.00. The excellent condition ring looks great. All that is required to make it look like new is a fresh rhodium plating after it’s been sized (if necessary). We have the ring and all its accessories estate priced at only $1,400.00 CAD. Stock #e10754. It looks like it’s 100 years old but in reality it was only made a few years ago. Art Deco designs like this have always been appreciated by the jewellery industry and the classic look is more popular now than ever. When you see a beautiful 2.10 carat natural sapphire with this kind of colour in a setting like this, the universal appeal of the look is undeniable. Balance, symmetry, geometric patterns and contrasting colours are all ingredients of original Art Deco design seen first in the 1920s and 30s. Architecture, art, automotive and even typical household items received the Deco treatment almost 100 years ago. Great design is the first element in quality and value but the rest of the components have to conform. The 2.10 carat natural sapphire is one of the best shades of blue we have ever had. Cut exceptionally deep the sapphire has a beautiful blue zone of colour running close to bottom of the stone. A clever stone cutter was able to exploit the colour zone to show even distribution across the entire gem. 22 round single cut bead set diamonds add over 1/3 of a carat of twinkle to the ring. Finely crafted from 10 karat yellow and white gold the Deco design features are further displayed within the pierced, milgrain, double gallery setting. The completed ring weighs 6.2 grams in a finger size 6.5. 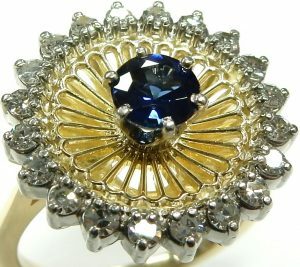 A colour like this is seldom seen in sapphires at any price and for the estate sum of $1,470.00 CAD don’t expect this ring to stick around too long. Stock #e8808. 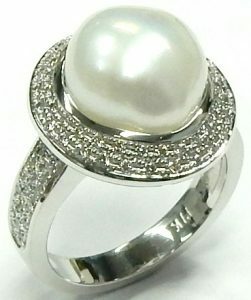 Sometimes classic jewellery items like pearl rings get overshadowed by expensive and sparkly large diamonds around here. Pearl rings don’t get many of the headlines at Bill Le Boeuf Jewellers. That’s too bad because every once in a while a fantastic example comes in to remind us of just how beautiful they are. This one is in “new old stock” condition. There are only a few light scuffs on the shank bottom to the original rhodium finish. It really looks like it’s never been worn despite coming with an appraisal dated October 2007 making the ring over 10 years old. Ten years old or made yesterday a style like this shouldn’t go out of fashion. The generous 17.8mm x 16.4mm diamond cluster outline makes for quite a dazzling show on the finger. Each of the 82 round brilliant cut diamonds have been hand set with 4 tiny gold beads ensuring none go missing. 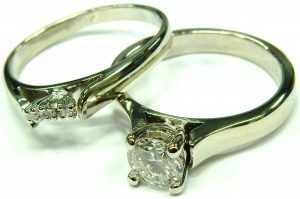 The diamonds have been well matched and are of very good SI-HI quality with an estimated total weight 0f 0.40 carats. The centre cultured pearl measures a slightly out of round 12.1mm x 11.1mm with a beautiful silvery white, fine grain luster of excellent quality. The size 6 1/2 ring weighs a substantial 8.8 grams in total and is constructed from high quality 14 karat white gold. The thick shank can be opened up to accommodate a slightly larger finger size if needed. Perfect condition in every way with a beautiful design. 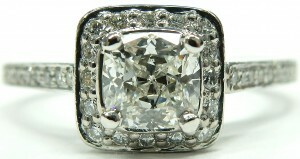 This is a ring that attracts attention and looks like a million bucks but is estate priced at just $1,190.00 CAD. Stock #e11813. Canadian anything usually comes with a slight premium to the price, but for the most part that premium is for good reason. Canadian made equates to buying local, supporting Canadian industry and keeping Canadian jobs. When Canadian refers to natural resources like gold or diamonds there is the premium of ethical sourcing. Our government holds mining and explorations companies to a higher standard of accountability than many other countries do. Requiring them to take larger precautions protecting the environment and supporting local communities. All in all Canadian anything does come with a premium but it isn’t a premium without purpose. This Canadian made diamond trinity ring is made from 3.4 grams of 14 karat Canadian gold. The solid ring is decorated with a total weight of 1.00 carat of bright and lively I1-IJ round brilliant cut diamonds. Currently measuring a finger size 5 1/2 there is some room to adjust up or down as needed. Estate price $1,400.00 CAD. Stock #e10521. Orange sapphire is not a gemstone you run in to very often, which is a shame considering the intense colour and brilliance that it displays. 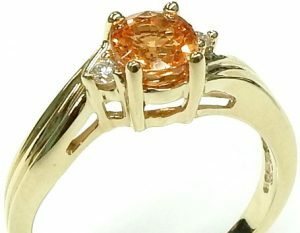 This 1.25 carat oval natural sapphire is a very high clarity and a pure orange colour. 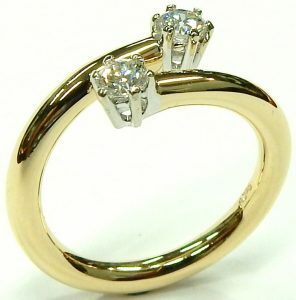 It’s made more intense set into yellow gold and and shouldered by two petite 0.06 carat round brilliant cut diamonds. The ring itself flows gracefully around its stunning center, drawing the eye in. Made from 3.9 grams of warm 14 karat yellow gold and currently measuring a finger size 7 3/4 the ring has plenty of room to adjust as needed. 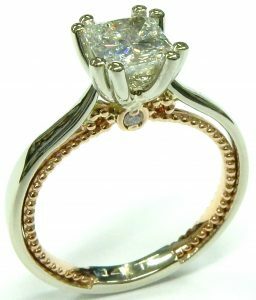 Accompanied by a fresh (October 2018) Harold Weinstein Ltd. insurance appraisal the ring is estate priced at $1,540.00 CAD. Stock #e11562. We’ve been buying estate watches and jewellery in the same downtown Barrie location for over 60 years. We pride ourselves on offering consistent, honest prices and opinions in a completely pressure free environment. This practice seems to have given us a respected reputation as our goldsmiths and diamond graders are called out of the repair center many times a day to answer questions and provide service and purchase advice. Not all pieces that we purchase are deemed appropriate for resale so some are taken apart. This has given us a substantial stock of loose diamonds in all cuts, qualities, and sizes that we use to make custom, one of a kind pieces for our clients. 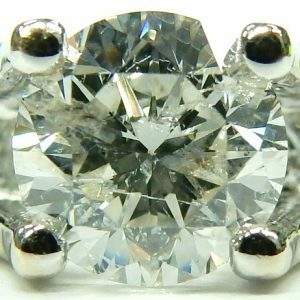 Unfortunately we don’t get much call for custom work using antique diamonds, though I suspect that is because many people don’t realize it’s an option. We decided to use these five well matched, high quality VS-GH old mine cut diamonds to make something beautiful and understated. Together these antique diamonds from the 1800s add 0.66 carats total weight of unique brilliance to the 2.6 gram 14 karat custom made white gold anniversary style ring. We made it a stock size 6 but there’s lots of room to size the ring up or down. 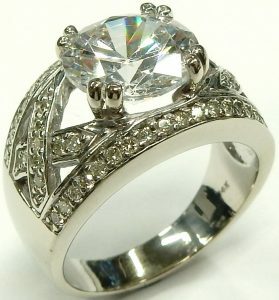 Brand new and brightly rhodium plated the ring is estate priced at $1,750.00 CAD. Stock #e9796. Do you have your tenth anniversary coming up this year? Skip the suggested traditional gift of tin or aluminum and get her a 10 diamond ring. The 10th anniversary is after all one of the 3 diamond anniversaries. 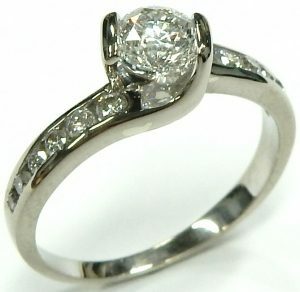 Trust us when we say a diamond ring like this will be a much better choice than anything made out of tin or aluminum. 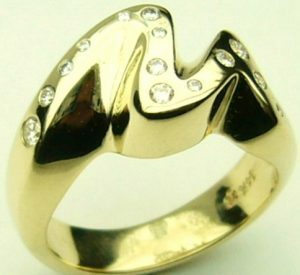 Well made from 3.6 grams of 14 karat yellow gold the ring contains a total estimated diamond weight of 1.00 carat. The bright and lively I1-I round brilliant cut diamonds are secured in a heavy channel setting made to last at least until the next diamond anniversary, the 30th. This ring will be a sparkling reminder of your first decade together, or any anniversary for that matter. Currently the ring measures a size 5.5. Our onsite goldsmiths are able to make it larger in just a day or so. It is in excellent like new condition and represents fantastic value for the estate price $1,190.00 CAD. Stock #e9693. Gucci jewellery is far more scarce than Tiffany in the estate displays at Bill Le Boeuf Jewellers. There is almost always a Tiffany ring or two here but this Gucci Stardust in 18 karat white gold is a first for us. It’s a honor to premier such a beautiful Gucci ring. This ring was purchased by the original and only owner in Toronto at the Gucci boutique in the summer of 2011. At the time this ring had a retail price of $2,150.00. 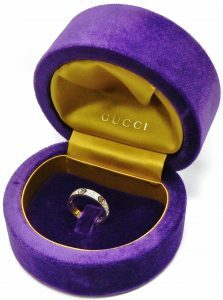 Today on the Gucci website the current version of the ring retails for $2,680.00. It may look the same but it’s actually a bit different having fewer diamonds weighing 0.19 carats total weight verses our older version with 66 diamonds weighing an estimated 0.25 carats in total. Nothing but top quality components are used by the craftsmen at Gucci in Italy. Premium 18 karat white gold and fully faceted round brilliant cut diamonds of minimum VS-F quality decorate the Italian made design. The 4.0 gram ring measures a finger size 7 1/2. The full eternity style with pierced logo design make it almost impossible for us to adjust the fit. We could laser weld a few sizing pucks in place to make it fit a little tighter but this ring is really designed for someone who is very close to a 7 1/2. Included with purchase is the original box. The crazy royal purple and greenish gold colour combination box is very striking and very well made with plush velvet and satin lining. 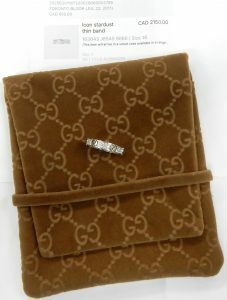 Gucci bag, purchase history document and never used travel pouch come included for the estate price of $1,876.00 CAD. Stock #e11808. Sapphire and diamond are two gemstones that are meant to be together. They compliment each others best qualities, bringing into focus the unique optics of each stone. The deep blue 0.70 carat (approximately) round faceted sapphire reflects flashes of dark cobalt blue. In contrast the two high quality VS1-GH round brilliant cut diamonds throw slivers of white and spectral light, each weighing an estimated weight of 0.30 carats. Together the three gemstones make an eye-catching trinity. The ring was made by Canadian manufacturer Corona from 2.8 grams of Canadian 14 karat white and yellow gold. It has been brightly refinished and measures a finger size 6 with room to go up or down. The ring must have been worn with another diamond ring in the past. 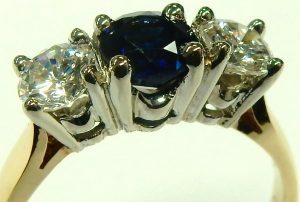 The sapphires roundness has been worn down on the exposed edges due to rubbing against something harder than sapphire. Since sapphire is second in hardness to only diamond, we think the sapphire was worn out of round by a diamond. Estate price $1,838.00 CAD. Stock #e9821. Is there a better way to start your morning than with a retro Birks ring made from all the best ingredients? The 0.43 carat vivid blue sapphire proudly seated at the center of the ring is a brilliant blue you must see in person to appreciate! The delicate and intricate open wire work that separates it from its diamond halo is made from extra warm 18 karat yellow gold; the perfect colour to compliment an intense blue. 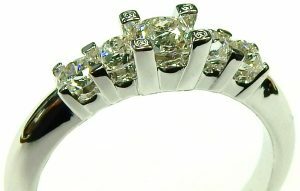 In typical Birks fashion the 20 round single cut diamonds that make up the white gold halo are of premium VS-H quality. Together they equal 0.35 carats and complete the eye catching appeal of this petite 5.5 gram statement ring. Currently measuring a finger size 3 3/4 the ring can be sized up a couple of sizes. Estate price $1,470.00 CAD. Stock #e11582. Sturdy well made anniversary ring containing nine baguette cut diamonds. Offering a solid line of diamond across the top of the ring with no gaps between the stones. The diamonds all are of very good quality VS1-G or better. One diamond has a minor chip on a bottom corner that is not noticeable. The 14 karat white gold setting weighs 4.1 grams in a size 5. The ring comes with a Gem Lap Appraisal Report that has estimated the replacement value of $3,600.00. This figure doesn’t make any sense to me but I guess everyone is entitled to an opinion and we all know what they say about opinions. Freshly refinished and looking like new the ring is estate priced at $1,190.00 CAD. Stock #e6843. 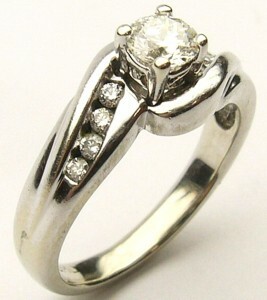 Aside from worn rhodium plating on centre prong tips from polishing after diamond was set this ring looks unworn. It’s perfect, just a quick dip in our ultra sonic cleaner and ready to go. The centre F colour excellent cut diamond weighs 0.42 carats faces up bright and white although the clarity is an I2. 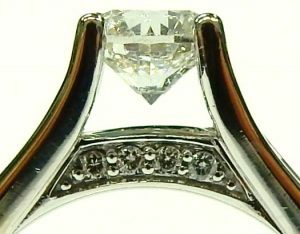 6 bezel set princess cut diamonds, 8 channel set baguettes of SI-IJ quality are set on shoulders and down shank. 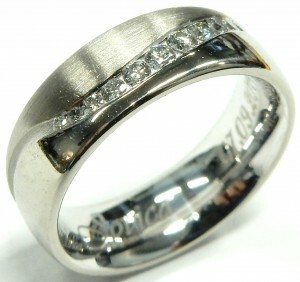 The premium 18 karat white gold setting weighs 4.2 grams and measures a size finger size of 7.25. The ring is estate priced at $1,050.00 CAD. Stock #e8077. Leave it to Peoples to max out the symbolism of an already symbolic engagement ring style. The three diamond ring was made popular by their “Past, Present, Future” campaign. Each of the three I1-HI quality round brilliant cut diamonds represent one of those stages with the largest, middle diamond as the “Present” of the trio. 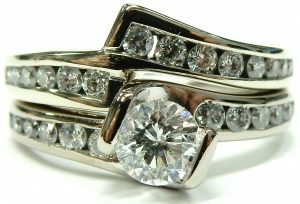 Following their theme Peoples have channel set three diamonds down each shoulder and two hidden diamonds inside the shank to separate the “Past Present Future” engraving. 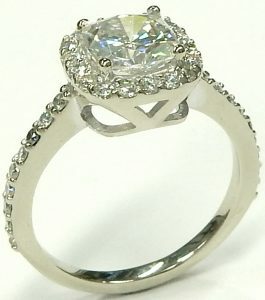 All together the 3.4 gram, 14 karat white gold ring contains 1.00 carat total weight of bright and meaningful diamonds. As a finishing touch the under galleries of the main diamonds have been decorated with delicate filigree hearts. 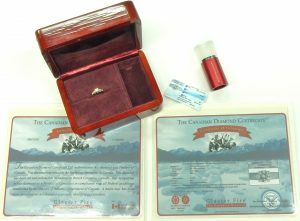 The ring is accompanied by a Gem Scan Laboratories 2013 appraisal listing it’s replacement value at $4,200.00 Canadian. Peoples website has the ring listed for $2,499.00 Canadian. Our estate price $1,500.00 CAD. Stock #e7596. The transition from Art Deco to more modern designs produced some very pretty rings in the 1930s and 40s. Our latest little estate engagement ring offering is very pretty indeed. There are still subtle Art Deco style elements discreetly incorporated into the decorative shoulders. While not as obvious as a true Deco ring, it’s easy to see the geometric symmetry. I’m not sure if it was by design, but the shoulder baguette and round single cut diamonds form a cute butterfly on each shoulder. 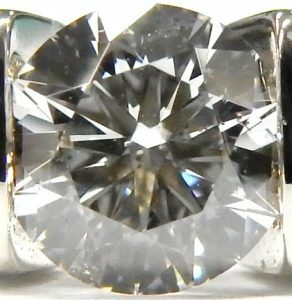 The centre old European cut diamond is a little bit older than the ring and likely saw duty in a different jewellery item before this ring was made. Measuring 4.5mm x 2.7mm the centre diamond is estimated to weigh 0.33 carats and is of very good SI1 clarity with a G colour. The 8 high qualilty side diamonds add approximately 0.08 carats of extra sparkle to the tiny size 4 ring. This ring would be best suited for a lady with a small finger as sizing potential is limited. 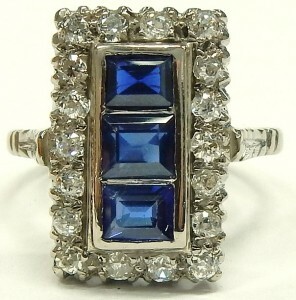 Estate price for this vintage ring is $1085.00 CAD. Stock #e11659. 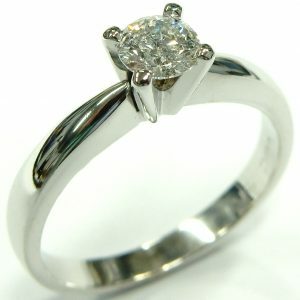 Very modern design with a very popular shape and size diamond. 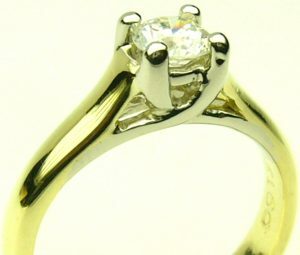 Canadian made 14 karat white gold solitaire engagement ring is only a couple years old in excellent condition. 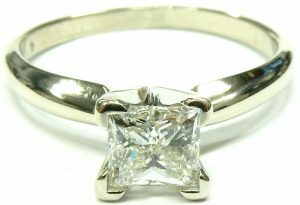 Containing a 0.50 carat princess cut diamond of very good SI1-I quality. This ring would be perfect for someone looking for an alternative to the traditional solitaire or the halo style engagement ring. A perfectly fitted 14 karat white gold wedding ring is included. 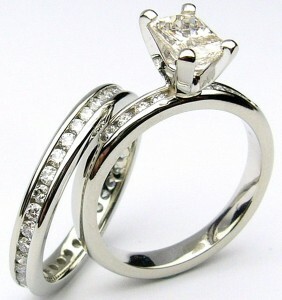 The wedding ring contains 4 channel set princess cut diamonds that tuck in like a puzzle piece with the engagement ring. Weighing a combined 5.2 grams, measuring a finger size 5 this set is a little smaller than the average but could be sized up as required. The two piece set is estate priced at $1,680.00 CAD. Stock #e8219. Seven years old but never used. This beautiful diamond solitaire has been patiently waiting in its original box for an opportunity to make someone extremely happy. The 0.52 carat excellent cut diamond has the attributes that many diamond experts feel represent great value and make for a super sparkly stone. The colour has been graded as an exceptional E, the clarity is a strong SI2 with scattered inclusions that are invisible without artificial magnification. It takes a microscope to resolve the string of tiny inclusions on the right side. The cut is excellent and exploits diamonds unique optical properties in a spray of brilliance and dispersion. The diamond does exhibit some strong fluorescence when exposed to filtered long wave ultraviolet light that can give the diamond a slight blue/white glow in sunshine. 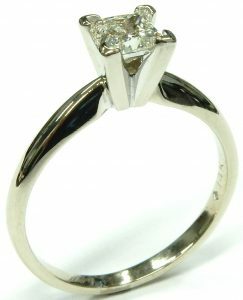 The attractive traditional 14 karat white gold setting measures a finger size 6 and can be adjusted up or down as required. The 3.9 gram ring is of sturdy construction and very well made. Perfect never worn condition as it was tried on once but never used. In 2011 this diamond ring was purchased for $3,465.00 plus tax. It comes complete with everything from that fall day 7 years ago. Original box, purchase receipt, diamond certificate, appraisal, warranty and even the original sales consultant’s business card. The price and value of a diamond ring varies immensely depending on where it’s purchased; do some homework to determine who offers the best value before making any diamond or jewellery purchase. This brand new diamond ring is estate priced at only $1,750.00 CAD and only at Bill Le Boeuf Jewellers, the diamond leader. Stock #e11756. 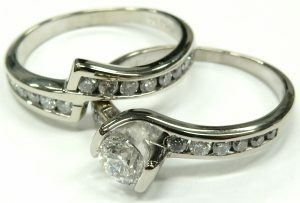 A petite wedding set from Canadian chain Charm Diamond Centers. 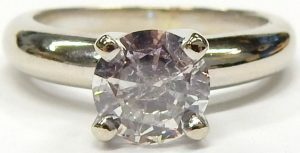 The feature of the by-pass style solitaire is a Canadian 0.24 carat round brilliant cut of excellent make and very good SI1-G quality. The diamond is a bright spark surrounded by wide 18 karat white gold swooping shoulders. At some point a fitted wedding band was custom made to tuck into the engagement ring, featuring a brief dash of channel set round brilliant cut diamonds. That understated band makes a perfect pair to the subtle engagement ring. Both pieces weigh in at 6.5 grams together and currently measure a finger size 6 3/4 with room to adjust. 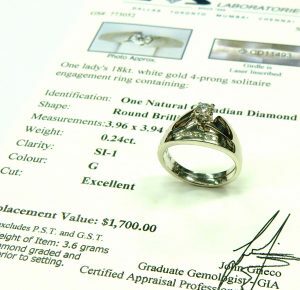 The engagement ring on its own has been issued a replacement value of $1,700.00 from a 2009 Gem Scan Laboratories Certificate. 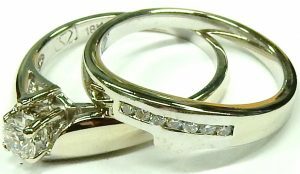 Our estate price for the two ring set is just $1,033.00 CAD, rendering the custom made one of a kind wedding band basically free. Stock #e10605. There comes a time with every successful business when inventory levels become a bit excessive in some segments. 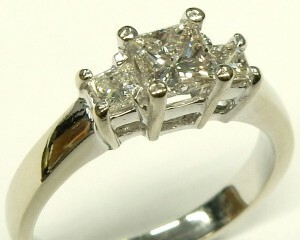 We have hundreds and hundreds of beautiful new and estate diamond rings like this. So now it’s time to find this one a new home as soon as possible to make some room for something else. This is a high quality square halo design with 62 nice lively SI-HI quality round and square brilliant cut diamonds. 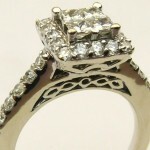 The set is made from 8.3 grams of 14 karat white gold in a finger size 5. The very contemporary design setting is in excellent condition showing no worn claws or thin sections. What a great idea to get the engagement, wedding and anniversary ring all taken care all at the same time for far less than you would expect. The three rings will be sold at a complete set only for the estate price of $1,325.00 CAD. Now that’s great value. Stock #e8388. There’s a reason Rolex still use single cut diamonds on their dials instead of the more popular round brilliant cut. The simple facet pattern of single cut diamonds creates larger and brighter flashes of white and spectral coloured light, giving more power to smaller diamonds. 0.45 carats of nice SI-H diamonds set into two parallel lines, make a brilliant bracket around the sapphire center. Carefully channel set into supportive galleries, the 10 square step cut sapphires are a bright vibrant blue and high clarity. The 0.25 carats of sapphires surrounded by diamonds and chromy rhodium enhanced 18 karat white gold make a classic, timeless statement. All told the ring weighs an even 5 grams and measures a finger size 7 3/4 with some room to adjust. Estate price $1154.00 CAD. Stock #e11469. This ring was sold new at Bill Le Boeuf Jewellers several years ago but was never used. It sat in a box until it was recently traded in. This ring looks very nice even though the stone colour is a little off. 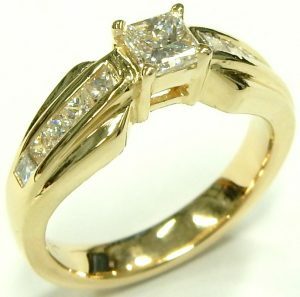 The traditional yellow gold setting weighs 3.9 grams and does not have a mark on it. 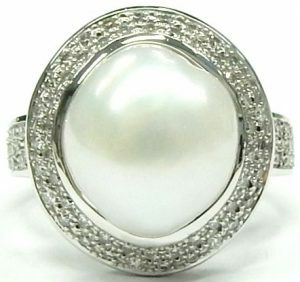 This pre owned never worn ring is estate priced at $1275.00 CAD. Stock #e6380. Keltica is a Canadian manufacturer that we’ve been proud to partner with for many years. The quality of craftsmanship is uncompromising and the designers have a passion for Celtic heritage that is evident in their work. This lesser seen eternity knot is a dynamic open wire design. It proudly states its presence in 14 karat white gold without looking bulky. The pattern on both, in the proper Celtic tradition, goes continually around in an unbroken pattern. The center jewel is a sparkling 0.46 carat round brilliant cut diamond of strong I1-I quality that is secured in a sturdy partial bezel setting. Both rings measure a small finger size 4 3/4 with room to adjust but the pattern will be interrupted. The pair were purchased new from Bill Le Boeuf Jewellers about 6 years ago. The base Keltica model can be seen on their website. Our estate price for the excellent condition set is $1,400.00 CAD. Stock number e11413. 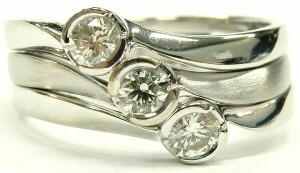 A modern classic design is the Lucia setting. This design can be recognized by the cross over gallery claws visible from the sides. 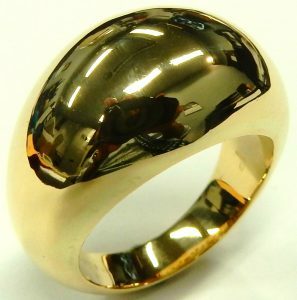 The example here is made from 4.2 grams of 18 karat yellow and white gold with finger size of 5.25. 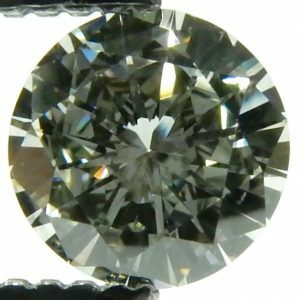 The 0.38 carat round brilliant cut diamond is a very good SI2 clarity with an outstanding colour grade of E and a very good cut. The diamond edge has been laser engraved with a registered number that guarantees the maple leaf diamond was mined, cut and polished in the Northwest Territories. 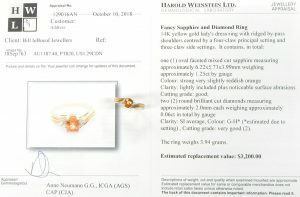 The ring comes complete with it’s original certificates and a Gem Scan evaluation with a rather optimistic replacement value opinion of $3250.00. We have the freshly refinished ring estate priced at $1295.00 CAD. Stock #e7195. If only this estate ring could talk, I wonder what it would tell us. It’s a curious combination of white gold in a design that appears to slightly predate the invention of white gold. 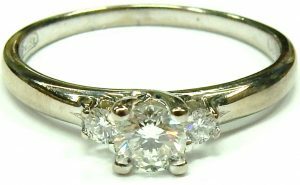 The style looks like it’s from the very early 1900s; but white gold didn’t come into widespread use until the mid to late teens. The genuine diamonds are period correct Old European and Swiss cut examples of strong I1-HI quality (a couple of the small stones are chipped). I suppose the ring could have been custom made in tribute to late nineteenth century Art Nouveau design anytime during the last 100 years. With a little further investigation the mystery deepens. The entire shank of the 4.7 gram size 6 1/2 ring was expertly replaced sometime in the past. It was likely changed because it became thin from decades of use. Whatever the history its ready for the future on the hand of the next owner. Showing little wear to the claws, fine milgrain or pierced details it’s ready to go with a display of antique sparkle unique to older cut antique diamonds. The centre diamond alone weighs a significant estimated 0.56 carats that would be worthy for use in any solitaire. A soft elliptical outline with a low profile combine to make this ring very comfortable and easy to wear. 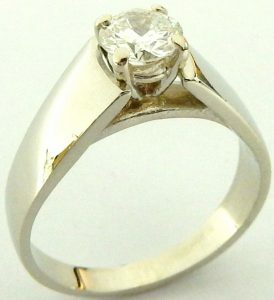 Excellent overall condition with the always popular Art Nouveau style make this a very desirable ring. It’s even more appealing when you consider the fantastic antique look for the estate price of only $1890.00 CAD. Stock #e11495. Simple and modern looking solitaire diamond ring containing one bezel set round brilliant cut diamond weighing approximately 0.45 carat of I1-H and a good cut. The 18 karat setting is well made and weighs 4.9 grams. This ring comes with an appraisal dated Nov 2000 and suggests a rather high retail replacement value of $3000.00. We feel its approximate replacement value would be closer to $1725.00. We have it estate priced at $1200.00 CAD. Stock #e6489. Ben Moss Jewellers has been around since 1910 and are one of a hand full of purely Canadian jewellery chains left standing. This engagement ring is a very versatile piece from their collection. 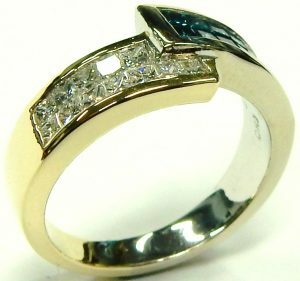 A traditional yellow gold channel set band is contrasted by an eye catching swirling white gold half bezel setting containing a bright sparkling 0.30 carat round brilliant cut diamond that floats above the channel. Containing a total weight of 0.425 carats of good looking I1-I quality diamonds and measuring a finger size 5 1/4. 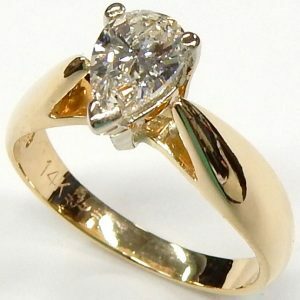 This 3.5 gram 14 karat gold engagement ring is perfect for the woman with an artistic eye. Estate price $1260.00 CAD. Stock #e9444. This engagement ring is about as Canadian as you can get; made from 3.70 grams of 14 karat Canadian white gold by Corona, a Canadian manufacturer, and containing a Canadian diamond. Not just any Canadian diamond either, this 0.44 carat princess cut was mined from the Ekati mine in the Northwest Territories and is a brilliant VS1 clarity in a white G colour. It’s been certified Canadian and laser inscribed with a maple leaf logo, the Canada Mark logo and serial number CMBE-203227. The ring itself is a very sturdy take on the classic solitaire style engagement ring and should make even the most cautious wearer feel comfortable. Currently measuring a finger size 6 1/2 with the capacity to be sized to nearly anything the ring is freshly polished and ready to go. Estate price $1736.00 CAD. Stock #e9617. The 3 stone diamond ring. Of the 1000s of estate rings we have sold over the past 1/2 century or so the classic 3 stone is rivaled only by the solitaire in popularity. Rings like this looked great 50 years ago, today and 50 years from now they’ll still be in style. A flat edge is easy to fit with an existing ring or a simple match for a wedding ring when the time comes. All three of these diamonds are very well matched with a SI1-SI2 clarity, FG colour and a very good cut to excellent cut. They are secured in low double gallery settings that will not hook or catch on anything. The 14 karat white gold setting measures a popular 3.0mm wide with a solid shoulder Tiffany profile shank/setting weighing 4.3 grams in a finger size of 6.75mm. You can’t go wrong with this design for any occasion. Estate priced at $1575.00 CAD. Stock #e8514. A statement making take on the popular X’s and O’s pattern measuring 14.15mm wide. To achieve that bulk without dipping into a six digit price point the ring’s been set with an 11mm cubic zirconia. A natural diamond of that size would weigh around 5.00 carats, with a nicer clarity and colour grade could cost on its own around $150,000.00 or more. The rest of the 52 hand set stones are indeed diamonds, all of I1-JK quality and together they weigh an estimated 0.50 carats. The substantial right hand ring weighs 11.1 grams and is made from 14 karat white gold. Currently measuring a finger size 9 1/2 the ring can be adjusted a little smaller if required. Estate price $1200.00 CAD. Stock #e11316. 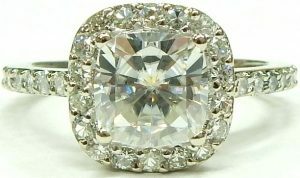 Looking for a current style diamond ring and don’t want to compromise quality or diamond size but need to do it on a budget? Here’s the ring for you. This unworn ring is in perfect condition and contains a 0.33 carat excellent cut SI1-F round brilliant cut diamond secured in a 6 prong setting. 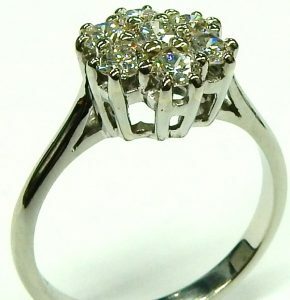 The 3.8 gram 18 karat white gold ring also contains 50 small bead set brilliant cut diamonds of SI clarity and I colour. The shoulder edges and gallery have been decorated with a mill grain border giving this previous owned by never used engagement ring a vintage look. 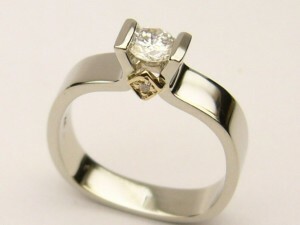 The finger size 6.5 is should fit the average finger but this can be changed easily by one of our on site goldsmiths. Estate priced at $1680.00 CAD. Stock #e8439. 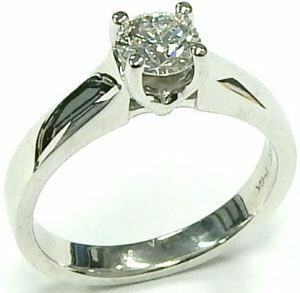 No need to worry about finding a matching wedding ring or having to get one custom made with this white gold solitaire. The 0.50 carat diamond ring comes ready to go with a matching diamond set wedding ring fitted perfectly to the subtle contours of the engagement ring. 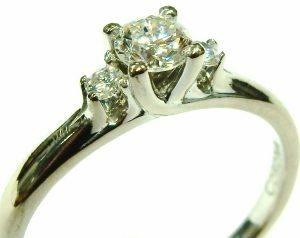 The rather petite size 4.5 white gold set weighs 5 grams and is in great condition looking like new with no wear on the claws. 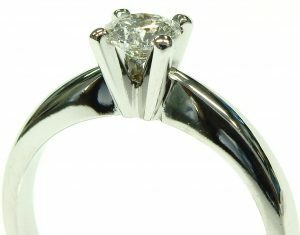 A sturdy 4 prong double gallery setting showcases a bright, lively G colour round brilliant cut diamond. The diamond measures a full 5.3mm diameter giving it a slightly larger footprint than most half carat diamonds. With a few scattered salt and pepper type inclusions we’re calling the clarity a conservative I1. Many would call this diamond a SI2 but we tend to have tougher standards than some of the documents we see. Included with sale is a certificate of appraisal from July 2009 stating the diamond is estimated to weigh 0.52 carats with a SI2 clarity and G colour. Our onsite goldsmiths are able to adjust the size larger if required in just a few days. Estate priced as a two piece set only for just $1960.00 CAD. Stock #e10401. If you’ve ever felt frustrated by the stock ring sizes that most jewellery stores carry, you’ll appreciate the varied sizes that can be found in our estate department. We have rings in all shapes and finger sizes and an impressive variety that go well beyond the 6 to 7 stock size. Some pieces were custom made larger, some special ordered in larger finger sizes but you’re almost guaranteed to find at least a couple that will fit right from the showcase. Of course if you don’t happen to find something you like in your finger size one of our onsite goldsmiths should be able to adjust most rings for you in a couple of days. 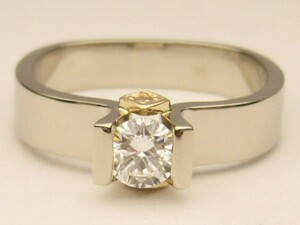 This particular 14 karat yellow and white gold engagement ring measures a size 10 1/4. The well made 3.6 gram ring features 0.32 carats of graduated, sparkling I1-I round brilliant cut diamonds securely set in strong channel settings. The white gold six prong head is a super safe home for the 0.68 carat I1-I round brilliant cut diamond that crowns this impressive ring. While not as popular as a four prong setting, the six claw variety makes the diamond appear a little larger while at the same time adding an extra level of security should a claw or two get bent or damaged. Estate price $1645.00 CAD. Stock #e10324. The five emerald cut diamonds that step their way across this rings surface were very obviously cut and polished to go together. Every pane reflecting and refracting light within the set graduate perfectly. Causing a synchronized and dazzling display of light making the diamonds look as one at a glance. 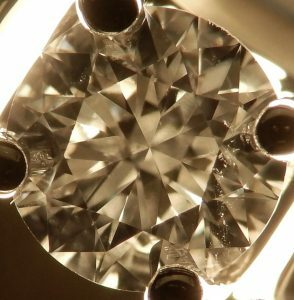 The 1.00 carat combined weight are of a higher VS-HI quality ensuring no visible inclusions interrupt their blinding light show. 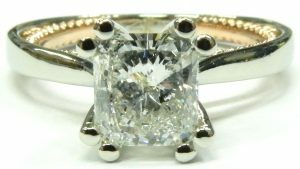 The diamonds are set into shiny white gold to disguise the prongs. The solid shank is made from yellow gold, allowing it to blend into the hand during wear and keeping the diamonds the focus. 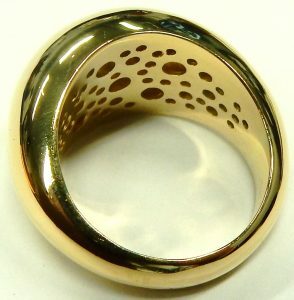 Currently the 2.9 gram 14 karat gold ring measures a size 5.5. Estate priced at $1400.00 CAD. Stock #e11234. The wrap around bypass ring is an inherently playful and modern design. It’s open and flexible, feeling young and new even though executed in more traditional yellow gold with six prong settings. The substantial 2.5mm in diameter round wire shank adds to that modern motif. The warm 5.0 grams of 14 karat yellow gold tipped with bright white gold settings make the diamonds that abbreviate the shank stand out more sharply. Not that they need much help making an impression; at a combined weight of 0.37 carats the well cut round brilliants shine brightly thanks to their very good SI1-H quality. Estate price $1050.00 CAD. Stock #e10299. Made in a size 6 1/2 with a substantial finished weight of 6.5 grams. 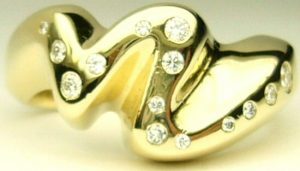 For a ring of this value it’s a little unusual that is was manufactured from 10 karat gold instead of the usual 14 karat. It has been assembled with an estimated 1.25 carats of I1-I2-JK round brilliant cut diamonds. Perhaps the 10 karat gold choice was as a compromise between durability and affordability. 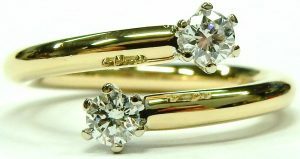 Regardless of the unusual gold karat selection and more modest clarity and colour the 35 diamonds still sparkle brightly. The 0.43 carat center is especially good looking at a glance thanks to its grade setting inclusions being a quantity of smaller inclusions, leaving large areas open to return light. As this photomicrograph shows. 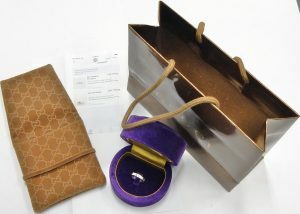 The ring is accompanied by an HKD Diamond Laboratories Report with yet another optimistic appraised value of $4700.00. 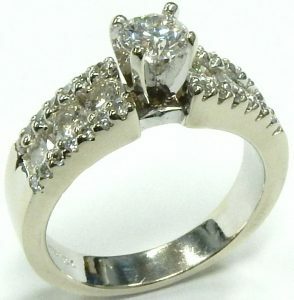 Our opinion of a competitive replacement value for this ring is a more realistic $1800.00. Our estate price is only $1080.00 CAD. Stock #e10928. Fun little platinum anniversary style ring made from 5.1 grams of extremely durable and white platinum. 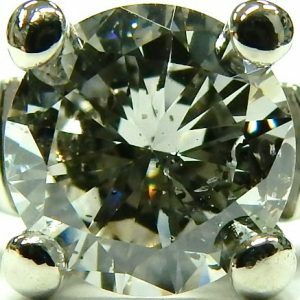 11 Gypsy set round brilliant cut diamonds circle the 2.5mm wide shank in a random arrangement totaling 0.17 carats of VS-GH sparkle. This ring was made by Canadian manufacturer Platinum Unlimited who supply some of Canada’s finest jewellers with unique high quality platinum jewellery http://www.platinumart.ca/ The ring measures a finger size 5.5. This ring could serve many different purposes from a wedding or anniversary ring to just a funky right hand ring. Estate priced at $1,050.00 CAD. Stock #e7895. A more modern version of a traditional solitaire. The 0.43 SI2-H pear shaped brilliant cut diamond is secured by a channel and prong setting strengthened by the yellow gold bar running through the bottom of the head. It really looks good and is easily matched with a flat edge wedding ring. The ring weighs 4.2 grams and is estate priced at $1180.00. Stock #e6189. 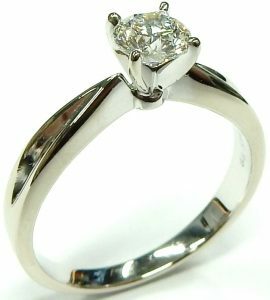 Simple 14 karat white gold solitaire containing a well cut 0.50ct. 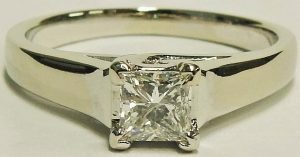 princess cut diamond of bright I1-H quality. The cathedral shoulder flat shank setting is well made from 3.5 grams of white gold. The ring measures a size 7 and can be adjusted up or down from there. Estate priced at $1330.00 CAD. Stock #e7062. It’s the whitest, most durable precious metal available. These qualities make it the perfect choice for setting diamonds. Platinum will last a few life times without the need for constant rhodium plating and the occasional retipping or rechanneling typical of white gold rings. This example is channel set with 7 small round and baguette cut diamonds all of very good VS-H quality weighing approximately 0.30 carats in total. The ring weighs 4.0 grams in a finger size 5. The flat edge channel set design fits many different rings and would make a great choice for a wedding or anniversary ring. Estate priced at $1050.00 CAD. Stock #e8148. 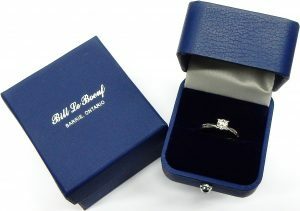 It’s amazing how many brand new never worn engagement rings come in to Bill Le Boeuf Jewellers for sale or trade. Adding insult to injury many of these rings were purchased at stores that would not refund the poor guys their money or even a portion of it. 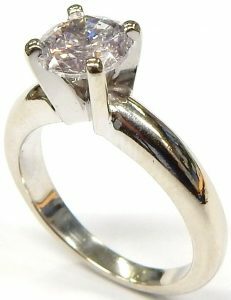 This brand new never worn example was made from 4.2 grams of 18 karat white gold in a finger size 6.5. Channel set in the shoulders are 6 tapered baguettes and 4 small round diamonds of VS-SI-HI quality totalling 0.28 carats. 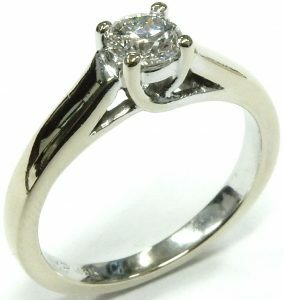 Secured in a six prong setting is a 0.38 carat round brilliant cut diamond of excellent cut and SI2-F quality. If you have a close look at the claw tips they appear a little yellowish. The slightly yellow colour is visible because when the centre diamond was set the claw tops were polished removing the rhodium plating. 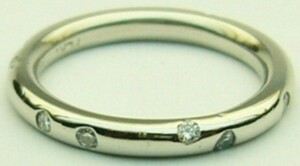 We will size and re-rhodium plate the entire ring at no charge for the purchaser. And yes if you don’t get the answer you’re hoping for a full refund will be given. Nobody does I DO like WE DO at Bill Le Boeuf Jewellers. Estate priced at $1638.00 CAD. Stock #e8287. 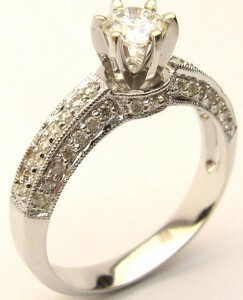 A certain fascination for diamonds seems to be the motivation for this graceful engagement ring. 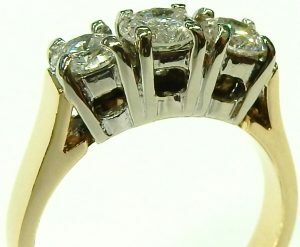 The unique wide open setting style shows absolutely as much of the center diamond as possible, while still retaining strength. The diamond being showcased is in fact a Canadian diamond that’s much brighter and livelier than our very strict I2-H grade suggests. Especially being set above an uninterrupted channel of square brilliant princess cut diamonds. Even the sides of the ring have been accented with petite round brilliant cuts, making it a treat to look at from any angle. All together the 2.3 grams of 14 karat white gold carries an impressive 0.84 carats of sparkling diamonds. Currently the ring measures a petite finger size 3 3/4 with some room to size up. Estate price $1386.00 CAD. Stock #e10280. If you’ve ever gone ring shopping you’ll realize pretty quickly that narrow shanks may not be for everyone. The girdling effect they can have on even the thinnest fingers can turn some women off narrow shanks all together. If you’re looking for a self-esteem proof solitaire this uber modern style might be your answer. Some times these wider styles can diminish the appearance of the diamond they hold, making them look smaller than they are. That’s not the case with this 6.5mm wide cathedral style shoulder ring. Executed in gently curving, highly polished 14 karat white gold, it plays perfect contrast to the vibrant facet pattern of the 0.59 carat round brilliant cut. The edges of the shoulders have been curved around the diamonds outline slightly, drawing the focus inward to hold attention on the eye clean SI2-I center. The modern ring measures a finger size 7 1/4 with plenty of room to adjust up or down as required. Estate price $1610.00 CAD. Stock #e10228. First come first serve. We’ve done it again. We’ve frustrated all others trying to compete with our estate offerings. Being in business for 60 years gives us a huge advantage in terms of diamond pricing at both wholesale and retail. We’ve been buying wholesale from the most competitive vendors and cutting factories in Mumbai and New York for many years. Over the decades we’ve learned a lot about finding where the best buys are. When we purchase estate diamonds the knowledge acquired by decades of experience allows our Gemologist and certified diamond graders to pay the right prices for estate diamonds. Our extensive knowledge plus our lower overhead means very few jewellery stores can come close to matching us in outright value. 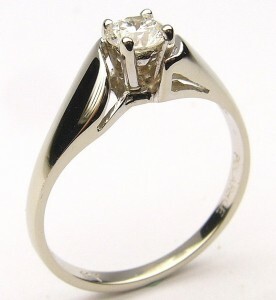 Our latest diamond solitaire is in like new condition (perhaps its never been worn). The full shank, 14 karat white gold setting is still 100% rhodium plated showing no scuffs or scratches of any kind. If you have a finger larger than the average this size 9 ring would be perfect to see what a 1/2 carat solitaire looks like on you. Our onsite goldsmiths can custom fit it to almost any size in just a few days if needed. The centre diamond is a very bright I1-H with an estimated weight of 0.50 carat. Measuring 5.15mm diameter the very good cut diamond displays some internal salt and pepper type crystal inclusions establishing the I1 clarity grade. Estate diamonds truly do offer better value than anything new. I remember a program we had 25 years ago with lighter 14 karat settings and brand new 0.50 carat diamonds of this quality selling for $1500.00. This estate ring offers a much heavier 4.3 gram setting and costs less than new examples did from 25 years ago. We have 1000s of estate diamonds in stock from 0.01 carat to over 9.00 carats, and all are priced better than anything you’ll see new. Estate diamonds don’t know they’re pre-owned and in most cases there is no way we can tell them from a diamond that was cut yesterday. 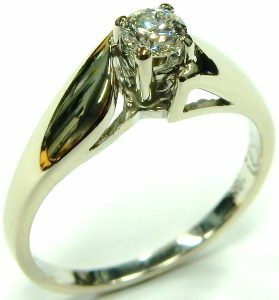 This is our latest estate diamond ring and is estate priced at only $1200.00 CAD. Stock #e11306. Nothing gives us more pleasure than providing a beautiful ring at a price that few are able to compete with. Knowledge coming form 60 years in the business goes a long way and a genuine passion for our craft make for an almost unbeatable combination. This lovely half carat diamond ring is a great example of a simple ring that simply can’t be challenged for overall value. The size 7 ring weighs 3.2 grams and is made from 14 karat white gold. The centre diamond is a very bright and sparkly I1 with a H colour. The I1 clarity is based on a white feather close to the edge that has virtually no affect on the brilliance but does help make the ring very affordable. This ring is in like new condition and is less than 2 years old. It came to us as many estate rings do with an appraisal that in our opinion is not reflective of its true value. 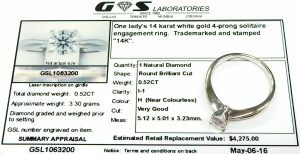 These optimistic documents are quite often used to demonstrate a false sense of value because I doubt the original purchase price was anywhere near the “Estimated Replacement Value” of $4275.00 that GS Laboratories suggests the ring is worth. While our estate price of only $1260.00 is well below the typical replacement value, it’s reflective of our commitment for offering our customers only true value. Ready to go, freshly refinished and priced at just $1260.00 CAD. Stock #e11155. Custom made rings present opportunities to express unique design ideas and the ability to combine different materials not normally seen in a single ring. Although this ring is not a one of a kind design, white gold with a single diamond has definitely been done thousands of times before, but it’s easy to tell this is a custom made ring. The quality of the construction is what sets this ring apart. It’s heavy, plain, and simple. Not just heavy for the sake of adding weight but heavy because it didn’t need to compete with dozens and dozens of other traditional style rings looking for your business by being the least expensive option. It’s basic yes but it was not made from the least expensive 10 karat gold option. The width, height and taper were not sculpted by a budget but by a clean well executed design. The result is a lovely looking ring that I’m sure cost a bit more when new but it wasn’t a compromise. 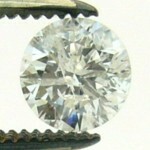 The centre diamond is a very good cut 0.30 carat round brilliant cut with an I1 clarity with a I colour. Jeff Walters Jewellers in Barrie created this simple but elegant 14 karat white gold design that weighs 8.9 grams in a finger of 8. Our on staff goldsmiths can alter the size up or down as required. Estate priced at $1260.00. Stock #e8437. If your taste is for the custom/contemporary look consider this unique solitaire. The rounded square shank is very comfortable to wear measuring an average size 6.5 containing one round brilliant cut diamond 4.48mm diameter weighing 0.33 carats of good quality SI2-G. The shoulders of the ring are connected by two diamond shaped rose gold castings each containing one small bead set round diamond. The ring weighs 4.3 grams and is still warm from a fresh refinishing. Estate priced at $1085.00. Stock #e6585. It’s only a few years old and in great condition. Just a quick rhodium plating to give it that chrome white look and it’s ready to go. You could choose to leave it in it’s “naked” and natural 14 karat white gold colour. Natural white gold is a soft blend of warm white due to the fact that 14 karat is still almost 60% pure yellow gold and part of that yellow colour always comes through unless it’s artificially plated with a pure white metal like rhodium. Anyway, enough about that. This is a really cool ring for someone who wants a slightly different wedding ring to wear on its own. The flat edge allows it to fit with many different engagement rings too. An infinite string of 45 diamonds runs around the entire circumference in a gentle smooth wave. One half of the ring is polished and the other has been treated to a satin texture. The contrasting finishes with a sparkling border of diamonds makes for one great look. The ring was made in Canada by CROWN RING. If you’re looking for high quality manufacturer, great design, tons of selection and great service Crown Ring deserves a look. The small diamonds twinkle with VS-H quality totalling 0.35 carats in weight. The size 5.75 ring weighs 6.0 grams. This ring is available in a gents version as well. It’s also available in yellow gold, rose gold and even platinum. This estate white gold version is priced at $1400.00 CAD. Stock #e9556. If your a regular customer of Bill Le Boeuf Jewellers or visitor to our website you’ll know that we regularly talk about some of the opinions found on many appraisals we come across. Everyone is entitled to an opinion and they are unique to the individual giving it, so naturally there will be some differences. At Bill Le Boeuf Jewellers we prefer to let our invoices represent the value, we really don’t like to provide appraisals on products we sell. We feel that supplying an appraisal on a ring or other piece of jewellery we have sold is a conflict of interest. 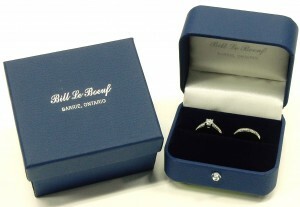 At Bill Le Boeuf Jewellers we would rather under promise and over deliver on everything we sell. Having our opinion second guessed is not likely to happen. That being said, here is a really pretty and well made custom engagement ring. Crafted in 14 karat white gold with a finished weight of 5.6 grams. The centre stone weighs an estimated 0.40 carats of nice I1-I quality and very good cut. The centre diamond might even be a weak SI2 but in keeping with our tradition we’ll call it and price it as an I1. 44 small bead set diamonds accent the shoulders and add an estimated 0.20 carats of I1-HI diamond weight. This ring came in on trade with a July 2014 appraisal stating a retail value of $6200.00 plus tax. Our opinion of a competitive retail replacement value is more like $2000.00. 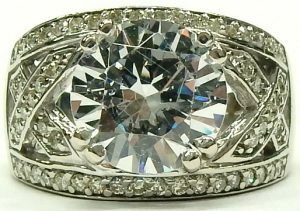 As an estate ring it is priced at $1400.00 and represents excellent value, but please don’t ask us to supply an appraisal. We would however encourage you to seek out a 2nd non biased opinion confirming the outstanding value. Stock #e8583. The only thing estate about this pretty ring are the antique mine cut diamonds used in the construction. Mine cut diamonds are really the first version of the basic brilliant cut design seen today. The 5 cushion shaped mine cut diamonds in this ring likely date back to the 1700s. Likely they originated in India where most diamonds came from before African discoveries in the later 1800s. I’m positive these diamonds have been used in many jewellery items over the past few hundred years. Rings wear out, styles and fashions change but diamonds are forever. The 5 diamonds look as good today as they did when brand new. We decided to honor the spirit of these old stones in a simple custom made ring. The versatile shared prong design was made from 3.3 grams of 14 karat white gold in the average size 6. All the diamonds are of very good VS clarity averaging H colour. This ring could be used as an anniversary ring or would make a great engagement ring with an interesting story. The edge is almost completely flat, allowing another ring to easily fit beside. Making custom rings like this is a great way to get high quality results without the high price typically associated with custom design. 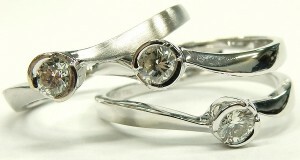 Bring us your ideas, we literally have 1000s of estate diamonds in all sizes to make something fantastic just for you. 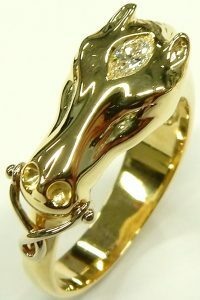 This ring is estate priced at $1750.00 CAD. Stock #e10016. If you want a quick education on diamond quality go to your local chain jewellery store and have a look at how their diamonds look through their showcases. Then take a trip to Tiffany’s or Birks and look at theirs. From a distance, simply looking through the glass of the showcase, the difference will astound you. Even their smallest accent diamonds will sparkle more vibrantly than the diamonds in your average chain store. That’s partly due to the higher clarity and colour grades of their diamonds but mostly due to the very good to excellent cut grades they demand of their diamond cutters. If you’d rather not take the drive to Yorkdale feel free to stop by and have a look at this outstanding cluster. The 7 well matched high quality VS-H round brilliant diamonds are all very well cut, making this the most blindingly brilliant cluster we’ve had in some time. Mirroring the quality of the 0.75 carats of diamonds that decorate the 10mm wide cluster the ring itself has been made of 3.4 grams of bright white 18K gold. The well made ring currently measures a finger size 6 with plenty of room to adjust up or down. Estate price $1540.00 CAD. Stock #e10095. The vertical sides of diamond rings are often overlooked and regularly left unadorned and unthought of. When we occasionally run across bands that features subtle details added to these sides they are meant to be hidden accents that only the wearer sees. This ring has its sides flared out to add a peek of sparkling interest when viewed from above. The two side channels of smaller diamonds work as brilliant accents adding a unique twist to the traditional channel set band. Altogether they make a perfect 1.00 carat estimated total weight of I1-J round brilliant cut diamonds in the 4.9 gm, 14 karat white gold setting. The ring currently measures a finger size 6 1/4 with some room to size up or down. Estate price $1050.00 CAD. Stock #e9987. Custom made right here in Barrie by Jeff Walters Jewellers and now it’s looking for a new home. Both rings look perfect showing zero wear of any kind. The claws and channels should be good for several decades under normal use. Well made in a finger size 5.25 from 5.3 grams of 14 karat white gold the rings contain 23 nice quality round brilliant cut diamonds. The engagement ring holds a 0.38 carat diamond of I1-F quality with a very good cut. It’s the superior cut that really makes the centre sparkle. Channel set along the shoulders and in the wedding ring are an additional 22 diamonds of SI2-I1-GH quality. Although these rings have been previously enjoyed you’d never know it. We have professionally cleaned and refinished them to a bright flawless polished finish. 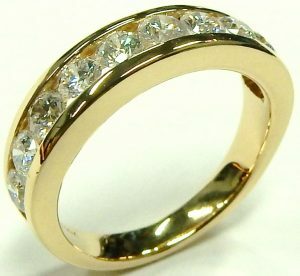 If you’re not a size 5.25 no problem, our onsite goldsmiths can adjust them up or down as required in just a day or so. As good as new and read go except at about half of the original price and this time they’ll come in a Bill Le Boeuf Jewellers box. Being sold as a set only for the estate price of $1750.00 CAD. Stock #e9344. Custom made Michael Smiley right hand ring 14kt. yellow gold $1150.00 CAD. I’m not sure what the inspiration was or if there even was one when this ring was created by local designer goldsmith Michael Smiley. 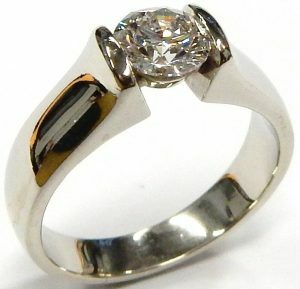 As per his usual format this ring is very well made using very high quality components. 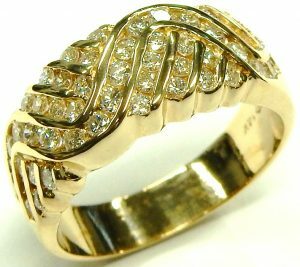 The highly polished 14 karat yellow gold setting weighs 8.4 grams and contains 14 Gypsy set round brilliant cut diamonds along the zig zag outline of the ring. The total diamond weight is approximately 0.20 carat and all are of VS-G quality. The ring measures a size 5 and could be sized up by our goldsmiths as required. Estate priced at $1150.00. Stock #e7113. Almost any custom made ring is going to cost you at least $1000.00, and that’s before you even add any diamonds. 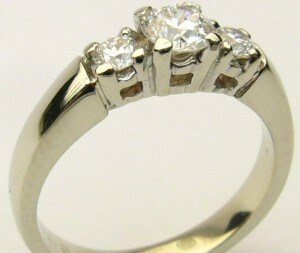 Here’s a classic style with nice quality bright diamonds for just a little over $1000.00. The 3.2 gram custom made ring was made to a very good standard. 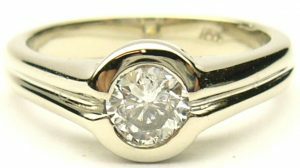 This 14 karat white gold ring has full solid shoulders with the popular double gallery setting style. The centre diamond could weigh more than half a carat but we have conservatively estimated the weight at 0.48 carat of I1-I quality. Each shoulder diamond weighs an estimated 0.10 carat each of SI-I quality. Currently the ring measures a finger size 5 but our onsite goldsmiths can adjust it in just a day or two. This style of ring can be used as a traditional engagement ring, an anniversary ring or even a right hand ring. The only evidence of wear is the fact the original white rhodium plating is worn off revealing the true soft colour of white gold. A quick size adjustment to your finger and fresh rhodium plating will have this custom made ring looking like it was made yesterday. Estate priced at $1045.00. Stock #e9533. 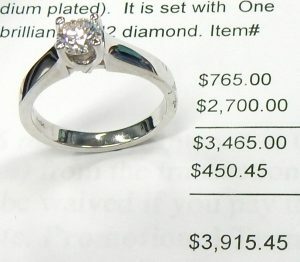 Here’s your chance to get a pretty Canadian diamond engagement ring, wedding ring and a matching anniversary ring all for less than the replacement value of the engagement ring alone. 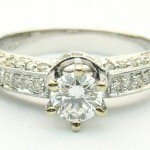 This style engagement ring has been a popular choice for a few years. The centre diamond weights 0.34 carat with an excellent cut that really shows off the nice H colour. A clarity grade of SI2 is based on a white crystal inclusion that falls just within the table border that is visible only with a little magnification. Two matching wedding rings have been soldered together on the bottom forming a sleeve that fits snuggly over the engagement ring completing the fully dressed looked. 16 additional channel set brilliant cut diamonds of SI2-I1-HI quality contribute to the 0.58 carats of estimated total weight. 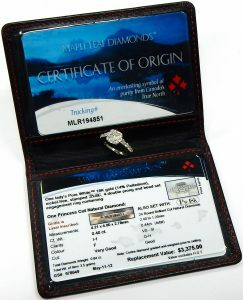 The centre diamond has been laser engraved with the image of a maple leaf and a unique serial number identifying its origin from the North West Territories in Canada. The 14 karat white gold set weighs 7.6 grams in a 5.5 finger size. Excellent overall condition. Only a quick polish and fresh rhodium plating will have it looking identical to new. Being sold as a set only for the estate price of $1440.00. Stock #e9007. Not just another anniversary ring. This one combines round brilliant cut and baguette cut diamonds all in the same channel. The look while obvious in an enlarged photo like this is very subtle in person. The baguette cut rectangular diamonds have completely different optical properties compared to traditional round diamonds. Their straight sides eliminate much of the gap associated with a round beside round arrangement. Made from 4.1 grams of more pure, more dense premium 18 karat white gold enhances the feel of the size 6 ring too. The 17 diamonds combine to weigh an estimated 0.44 carats in total of excellent VS clarity and G colour. 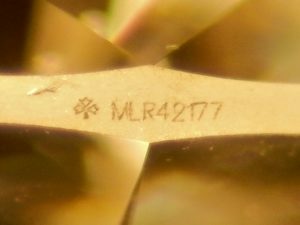 One of the round diamonds has a small chip on the crown that is only visible under strong magnification. A slight yellow tint is evident in the ring because the white rhodium plating was removed when the ring was polished. This yellowish/white hue is always present in white gold because even the whitest alloy can’t conceal all the rich natural colour of gold. After sizing we would be happy to rhodium plate the ring restoring the pure white finish again for no charge. Estate priced at just $1190.00 CAD. Stock #e9395. You could use this ring as an engagement/wedding ring set, dinner ring or just a fun single or three section right hand ring. Just looking at it you’d never think it can come apart into two sections. When together they fit snugly like puzzle pieces without any gaps. A brushed finish on the centre ring contrasts with the highly polished outside section making a striking tone on tone display. 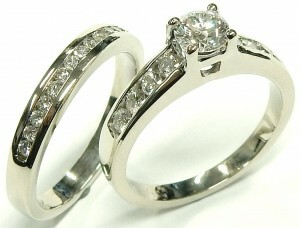 Three matching semi bezel set round brilliant cut diamonds are set super low making for a very comfortable design. Total gem weight is an estimated 0.45 carats of nice VS clarity and IJ colour diamonds. Made from 18 karat white gold the rings are heavier than one would suspect with a finished weight of 6.8 grams. Being a sleeved design they are a little bit more tricky to size, but it is possible to adjust them up or down from the current size 7.25. Sold as a set only for the estate price of $1540.00 CAD. Stock #e9365. Emerald has been mined and coveted by many cultures for well over 2000 years. The green gemstone was a favorite of Cleopatra and Incan royalty. It’s easy to see what all the fuss was about gazing into the depths of this 0.70 carat emerald. The bright green flashes are made even more lively looking surrounded by the busy brilliance of 0.20 carats of high quality VS-H diamonds. Considering the high quality ingredients its no surprise that the one of a kind ring was hand made from 13.1 grams of heavy 18 karat yellow gold. The substantial ring measures 8 1/2 with room to size up or down. Estate price $1540.00 CAD. Stock #e10477. For just $1540.00 this ring will really fill up the petite finger. At only a size 4 1/2 this ring is best suited for someone’s smaller fingers. Good things come in small packages is a saying that applies to this ring as well. The virtually flawless 0.44 carat VVS2 round brilliant cut diamond measures a full 5.0mm diameter and faces up white and bright. If we didn’t grade and weigh this diamond before it was assembled we’d swear the colour was more in the HI range and weighed much closer to 0.50 carat. Only the bottom portion of the shank isn’t pave set with tiny brilliant cut diamonds. There are 68 of the tiny 1.0mm – 1.3mm diameter bead set diamonds set on the shank and shoulders. The quality of the small diamonds are a lively bright I1- IJ on average. Even though this ring is only a size 4 1/2 one of our onsite goldsmiths could make it 1 or 2 sizes larger in only a day or two. The ring is just a couple of years old and showing wear only associated from refinishing to remove some light surface scratches. A quick rhodium plating will restore the bright whiter than white gold finish and have this ring looking perfect. It’s a lot of ring for the estate price of $1540.00 CAD. Stock #e10831. Set girdle to girdle this princess cut anniversary band is back to back brilliance. 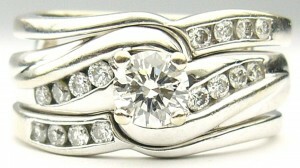 Paired with squared off corners and mirror finished planes of 14 karat white gold this ring is as modern as they come. 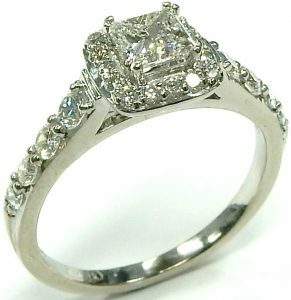 The protective channel setting is low profile, carrying an estimated 1.00 carat of bright SI-HI princess cut diamonds. The ring as a whole weighs an impressive 3.3 grams, speaking to its sturdy build. It currently measures a petite 4 3/4 with very limited room to adjust. Estate price $1,400.00 CAD. Stock #e11857. When it comes to uncompromising quality the German’s have a reputation for producing some very high end products. From automobiles to appliances and even the machines that make them, Germany is one of the world’s leaders in technology and industrial manufacturing. A great example of high quality, excellent design and excellent build standards is this ring made by acredo. Mostly catering to the European Union this German jewellery company makes some very nice wedding and engagement rings. Our excellent condition estate example can be found on the acredo website with a price of 1970.00 Euros or about $2950.00 CAD. The ring measures 6.0mm wide in a tiny size 4.75; you’ll need a very small finger for this one to fit. A wave shaped channel contains 13 high quality VS-FG graduated round brilliant cut diamonds that are estimated to weigh 0.18 carats in total. 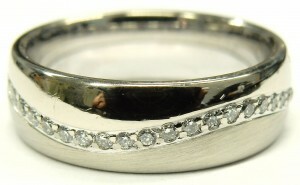 If you have a small finger the 7.8 gram 18 karat white gold comfort fit design will feel great. It will take a bit of work, but if you need the ring made bigger we can size it up as necessary. The half brushed half polished finish separated by the wave of bright diamonds makes for one very cool design. Estate priced at $1540.00 CAD. Stock #e9411. This could be the universal ring. It’s a wedding ring, an anniversary ring, a dinner ring and a right hand ring all at the same time. The striped wavy patterned channel design is ultra modern, yet the rich 14 karat yellow gold is very classic. Expertly made in Canada by Boas & Farro, who have been crafting fine jewellery in Toronto for over 100 years. 55 high quality SI-HI round brilliant cut diamonds are securely set in a central wave shaped channel splitting the four straight diagonal intersecting sections. The effect is very clever and almost vertigo inducing. Super low and very smooth, this ring is very easy to wear. The 5.5 gram ring measures a size 6 1/2 and can be adjusted up or down a size or so. Total diamond weight is estimated at 0.75 carats. Estate priced at $1330.00 CAD. Stock #e10443. Few things in jewellery are more attention grabbing than a mosaic of diamonds. The facet patterns of round brilliant cuts and baguette cuts couldn’t be more opposite to each other. That stark contrast works to the advantage of this geometric dinner ring, putting the 0.66 carats total weight of diamonds in dramatic relief against the high polished shoulders. The bright diamonds are all of nice SI2-I1-H quality and together span an eye catching area of 17.60mm X 8.45mm. Weighing in at 5.7 grams the 14 karat white gold ring is brightly refinished and measures a finger size 7. Estate price $1050.00 CAD. Stock #e10025. If you didn’t think you could afford a high quality Canadian diamond ring here you go. It comes with all kinds of documents and certificates. 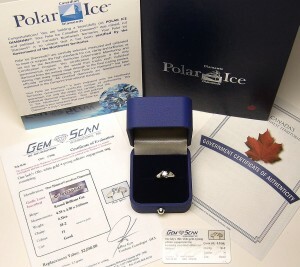 A Gem Scan certificate of Evaluation dated Feb-2006 proclaiming a replacement value of $2050.00, a Gem Scan wallet card and Northwest Territories Government certificate of authenticity with registered Gemprint. Polar Ice diamonds are one of the very few Canadian diamond brands that not only are mined in Canada but are also completely cut and polished in Canada too. As with all Canadian diamonds a unique laser engraved registered number can be seen on the girdle using powerful magnification. The 2.4 gram 18 karat white gold setting is quite attractive; a soft twist formed by the shoulders frames the diamond in a subtle embrace. Measuring the average ladies finger size of 6.5 the ring can be adjusted up or down a couples sizes to fit your special lady. Our on site gold smiths can accomplish this task sometimes the same day. The ring is in perfect condition, the only thing it’s lacking is a hand to be displayed on. 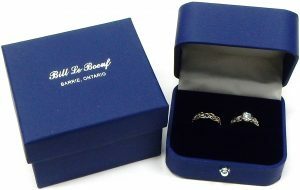 Complete with the traditional Bill Le Boeuf Jewellers small blue ring box the ring is estate priced at $1036.00 CAD. Stock #e9123. Natural pink sapphires are not nearly as popular as their blue counterparts. It’s hard to know why when you see one this nice set into such a lovingly detailed ring. The high quality emerald cut sapphire flashes every hue of pink from a delicate blush to deep magenta in its corners. The gem’s made even more brilliant looking thanks to the 0.35 carats of high quality VS-H diamonds set all over this delicate ring. The 14 karat white gold ring is almost more interesting when viewed from the side, covered with hidden details for the wearer’s eyes only. Measuring a size 7 1/4 with room to go up or down the ring is newly polished and ready to be cherished. A quick rhodium plating after size adjustment will fully restore a bright white finish. Estate price $1400.00 CAD. Stock #e9945. 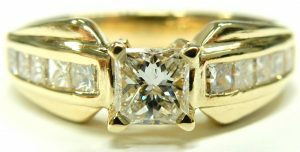 Canadian diamond, Canadian gold, made by a Canadian company; what’s not to love? 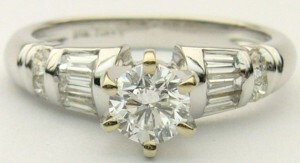 The Maple Leaf Diamond that crowns this patriotic little ring is a very well cut 0.33 carat of I1-I quality. Its been laser engraved along the girdle edge with a registered serial number ensuring the Canadian pedigree. 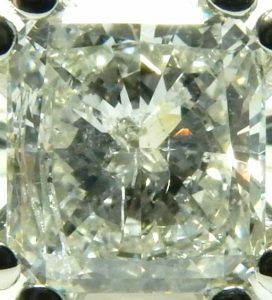 We always emphasize cut over all other C’s and this is why, the center diamond is so brilliant its grade setting inclusions are nearly lost to the naked eye. The combined 0.09 carats of accent diamonds mirror that high dispersion, dressing the understated ring in brilliance. The 3.2 grams of top quality 18 karat Canadian white gold has been made even more exceptional being alloyed with bright white, allergy neutral palladium (from the platinum family of metals) making the ring whiter than the typical white gold alloy. The Canadian ring currently measures a finger size 8 with plenty of room to adjust up or down. Estate price $1,120.00 CAD. Stock #e10633. It is possible to get a good looking well made 1.00 carat diamond ring for just a little over $2000.00. Clarity enhanced diamonds offer the look of much more expensive diamonds for significantly less. The key to the clarity improvement is to conceal surface breaking feather type inclusions with a compound that mimics the optical properties of a diamond. The original inclusions are still there but know they are far less visible (sometimes almost completely). This nicely cut radiant diamond measures 6.13mm x 5.60mm and faces up with a conservative appearance of a strong I1 with an HI colour. The 14 karat gold setting features subtle interior rope edges of rose gold with a surprise Gypsy set small brilliant cut diamond on each side of the lower gallery. Unless you are a very savvy jeweller/gemologist you’d never even be able to detect the treatment. Clarity enhanced diamonds can be worn like any other diamond. They do not require any special care and are safe to be cleaned with all consumer cleaning solutions including ultrasonic machines. The only caution that needs to be exercised is around extreme heat but only the sort of heat a ring would experience when being sized or re-tipped with a jewellers torch. The size 6 1/2 Canadian made ring is in like new condition as it was only worn for a short period of time. Purchasing a new unenhanced I1-HI radiant cut diamond in a ring like this would cost you around $5000.00. 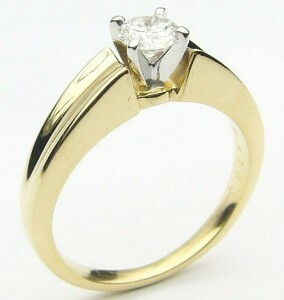 As a clarity enhanced example the ring is estate priced at just $2100.00 CAD. Stock #e10875. 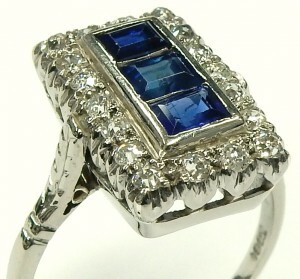 Rectangular outline and contrasting blue sapphires with white diamonds are unmistakable Art Deco design features. 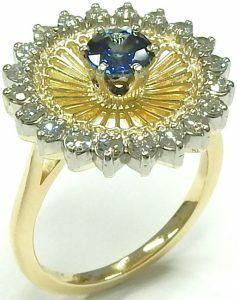 This 18 karat hand made ring weighs 5.2 grams and contains 3 medium hue blue sapphires. The very pleasing colour sapphires are estimated to weigh 1.55 carats in total. 18 old European cut diamonds with an estimated total weight of 0.55 carats supply the perimeter with sparkle courtesy of the nice SI-HI quality. Currently measuring a finger size 10 for the slightly larger finger. Our onsite goldsmiths can make a little bit smaller in just a day or two. Hand engraved shoulder details and pierced setting galleries reinforce the Deco look. The sapphires are showing some wear in the form of small scratches and tiny nicks along some facet junctions but overall condition is very good given the rings age. Included with purchase is an older Gem Scan appraisal that dates 2007. Estate price $1750.00 CAD. Stock #e9366. Bill Hake was an accomplished hand engraver who had started his jewellery career working for one of the larger Canadian silversmithing companies engraving their pieces. By the 70s he’d set up his own business in Barrie making and selling fine jewellery. From time to time we used his hand engraving skills for more intricate engraving work as there was no one equal to his skill north of Toronto. His business, Hake Jewellers, still stands today and is now run by his children and that’s where this beautiful ring came from originally. It’s easy to tell from a single glance that the ring was made with care from top quality components. The 0.30 carat total weight of round cornflower blue sapphires are of excellent quality, adding intense colour to the 14 karat white gold ring. They shoulder between them a 0.48 carat round brilliant cut diamond of SI1-H quality, very good cut. 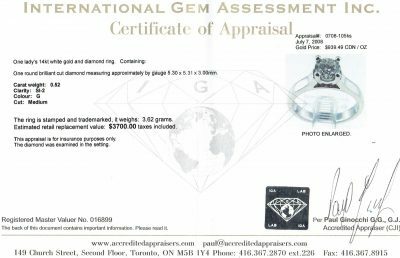 The diamond was certified and laser inscribed by the Gemological Institute of America and is accompanied by a Diamond Dossier that can be viewed here. The ring weighs a solid 4.2 grams and measures a finger size 5 with room to size up or down as required. Along with the GIA report the ring is accompanied by a 2008 appraisal from Hake Jewellers. Our estate price $1,960.00 CAD. Stock #e9824. Despite its petite scale and size this Maple Leaf diamond engagement ring packs a sparkly punch! 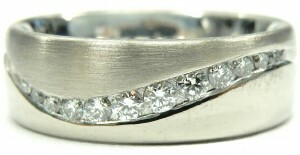 All bright white gold and diamonds the ring features 0.44 carats of VS-SI-GH round brilliant cut diamond accent stones. Set into the shoulders they’re graduated gently in order to move the eye towards the halo center. 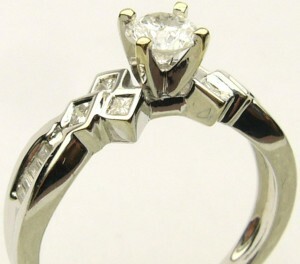 The center is a certified Canadian Maple Leaf princess cut diamond weighing 0.40 carat of I1-F quality. All told the 3.2 gram 18 karat white gold ring is set with 0.84 carats of white diamonds. Currently the ring measures a finger size 5 1/4 and is accompanied by its certificate of origin which lists a generous replacement value of $3,375.00. Our estate price for the ring $1,750.00 CAD. Stock #e11628. Cartier is one of the pillars of the high end luxury jewellery world, allowing their pedigree to raise the caliber of even their most understated offerings. 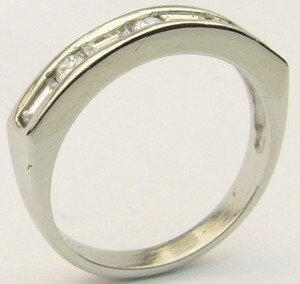 Take this simple, high dome platinum band for example; the 3 gram ring contains about $100 worth of platinum (as measured by commodity value only). It’s been set with a 0.01 carat round brilliant cut diamond of exceptionally high VVS-EF quality. 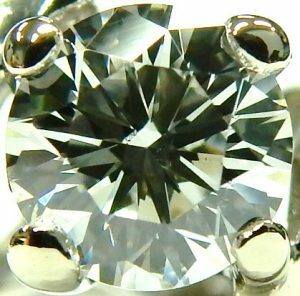 The value of a generic diamond of this quality is around $25.00 Canadian. Of course no ring ever priced solely on the value of its parts, there are manufacturing costs, labor, taxes/duty to pay for and only Cartier can decide the value their brand brings to the equation. 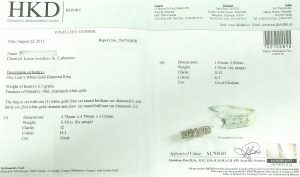 Cartier sells this ring for $2,000.00 plus tax and we have the original bill of sale from 2015 that demonstrates it. The premium price speaks volumes of the added value of the Cartier name. You also get some beautiful packaging, certificates, and lots of fancy receipts, folders and envelopes. It’s not a complicated ring to manufacture and Cartier have done a superb job of crafting this relatively straightforward design. 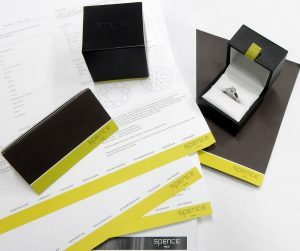 The size 7 1/4 wedding band measures 2.58mm wide by 1.27mm thick and is accompanied by its original Cartier receipts, certificate booklet, and inner/outer box. Estate price $1,200.00 CAD. Stock #e11520. There are few designers around who’s styles are as easily recognized as New York’s David Yurman. His use of the twisted wire cable look in so many of his creations make them instantly recognized as a Yurman. We seldom see his works come through our estate department, when they do they are usually one of his entry level sterling silver items. I don’t ever remember one of his top of the line 18 karat yellow gold pieces. This heavy weight 11.8 gram genuine amethyst ring is from the now retired Noblesse collection. Most of the rings you see from this series are constructed from sterling silver or silver with just a yellow gold bezel on top. 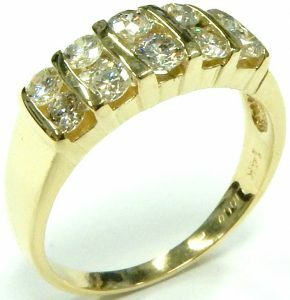 Our excellent condition estate example is completely made from premium 18 karat yellow gold. The only evidence of use is just some minor softening of the cross cut facet junctions on the crown of the high quality 14mm x 12mm amethyst. The size 6 plus ring can easily be adjusted up or down by one of our onsite goldsmiths. The one owner ring comes complete with the original draw string travel pouch. Estate priced at $1,750.00 CAD. Stock #10778. For someone who wants the ultimate in quality and brand name without the original cost. Tiffany’s premium quality platinum wedding ring in like new condition. Comes with the original Tiffany blue pouch, inner and outer box. Size 8.5, measuring 4.5mm wide, weighing 9.7 grams and retailing at $2,150.00 on the Tiffany website. 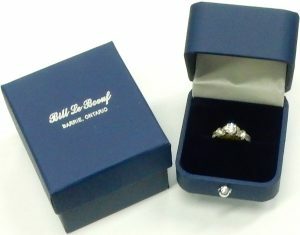 Bill Le Boeuf Jewellers will engrave each ring with a special date or message at no charge if you like. Estate priced at $1,505.00 CAD. Stock #e6356. Pear shaped diamonds offer an affordable option compared to premium priced round diamonds. They are at least 20% less expensive yet look larger because of the slender pointed shape. 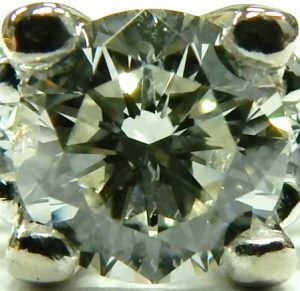 It’s pretty difficult to get a nice looking round diamond approaching 2/3 of a carat for anywhere near this sort of price. The simple 2.8 gram 14 karat yellow gold setting is a classic design that showcases the pear shaped brilliant cut with its tapering “tulip” shaped shoulders. It’s a less in more look in a refreshing shape that your friends won’t have. 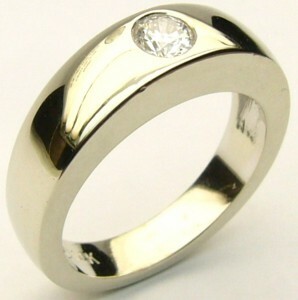 When the time comes for a wedding ring the flat edged design will open up hundreds of possibilities for wedding rings. No need to pay a premium for a custom made interlocking design. Estate price for this cautiously graded SI2-JK 0.65 carat pear shaped diamond ring is only $1,575.00 CAD. Stock #e10203. 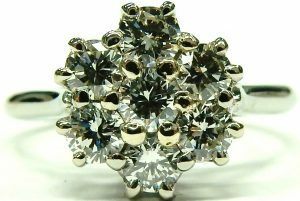 For $1120.00 CAD you’ll be amazed how much sparkle an estate ring like this can offer. The ring makes quite a statement on your finger with a width of 11.4mm and contains an estimated 2.00 carats of bright I1-I2-I diamonds. These aren’t minuscule opaque diamonds either; there are 58 fully faceted round brilliant cut and baguette cut diamonds that certainly have some inclusions but sparkle more than you’d imagine a ring in this price range could. The 10 karat white gold setting weighs 5.9 grams in its current size 9 1/2. 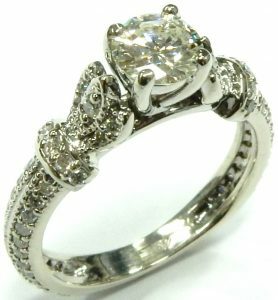 The pierced filigree lattice inside the top gives the ring more strength than a hollow back and still allows the ring to be easily cleaned. Shows very little wear and tear with a bright polished rhodium finish completely intact. 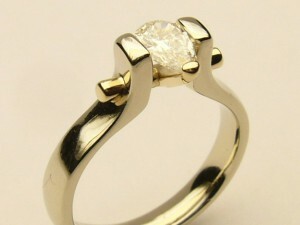 Our onsite goldsmiths are able to adjust the ring down a few sizes if necessary. Estate priced at $1,120.00 CAD. Stock #e11132. Something about this unique eternity band feels inspired by a delicate scalloped lace edge; a theme often found in women’s jewellery especially bridal pieces. Before the industrial revolution all lace was hand made by artisans devoted to their craft. It could take many weeks to create only a couple of intricate inches. For centuries, before technology allowed efficient production of fine lace products they were only an item enjoyed in the fashions of the European upper classes. Though our interpretation is made from 3.6 solid grams of 18 karat white gold the delicate inspiration is very clear. The scalloped edges also extend beyond the diameter of the 31 round single cut diamonds that decorate the band. This extra width adds a nice framing contrast to the distinct brilliance and fire. The 0.77 carats are all of SI-I quality, finishing off the high end feel of the band. 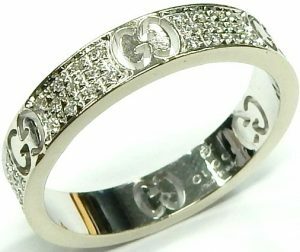 Like most eternity bands this has very limited potential for sizing and currently measures a size 6. The beautiful band is accompanied by our in-house insurance appraisal, written for the original owner. The competitive replacement value for insurance purposes only is $1,500.00 our estate price $1,050.00 CAD. Stock #e10827. This is the most understated use of rose gold we have come across; you have to look twice to spot it in person. The subtle effect is very inconspicuous as the soft rose tone creates an understated nest for the 24 petite round brilliant cuts it carries. The diamonds appear to twinkle pink, tightly bead set in their low profile row. The simple, straight edges of the set create a timeless appeal, not lending itself to any passing trends. The main diamond of the 0.50 carats combined total weight is of the same I1-IJ quality as the rest. Raised between the twinkling rosy shoulders it makes an elegant focal point. The Canadian made set consists of 7.1 grams of 14 karat white gold. Currently measuring a finger size 7 3/4 with some room to adjust up or down as required. Estate price $1,120.00 CAD. Stock #e11438. The halo design has been around long enough that it can’t just be considered simply a passing fashion trend. In fact if you look at antique and vintage jewellery styles you’ll see halo design elements in many examples. BIRKS Amorique line of engagement rings are testament to the staying power of the halo as these rings are at least 10 years old as the laser engraved shank shows. In fact both the platinum engagement ring and wedding ring are current offerings on the BIRKS website. The set is priced at $8,845.00 and up at your local BIRKS store. We have great examples of many estate rings at Bill Le Boeuf Jewellers but getting an exceptional BIRKS, Tiffany or Cartier ring is always just a little bit more exciting. Platinum is so durable that a few short years of use is hardly noticeable. Platinum rings are far more tough than white gold. Often platinum rings last generations. This 6.7 gram set is in lightly worn condition showing only some surface scratches. We will refinish to look like new after a complimentary sizing if needed. 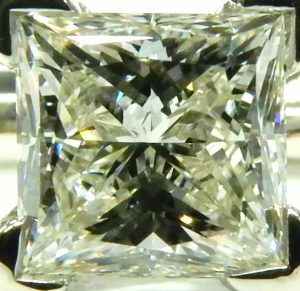 The halo is framing an uncommon 0.54 carat cushion shape brilliant cut centre diamond of very good SI1 clarity, G colour and very good cut. 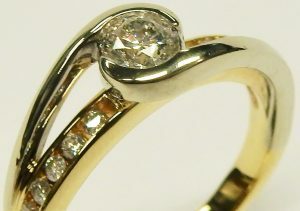 The cushion shaped centre diamond fits the soft edged halo frame much better than a round stone. Accompanying the diamond is a BIRKS diamond certificate outlining all the details and confirms the registered identification number laser engraved on the stone. 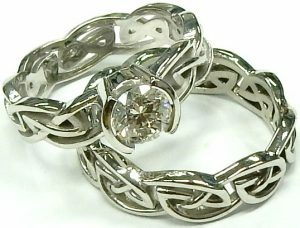 It would be nice to keep the two rings together as a matched set although they are priced separately at $3,810.00 and $1,497.00. The expertly bead set accent diamonds in the halo and on the shoulders add an additional 0.31 carats of VS-GH sparkle to the set. 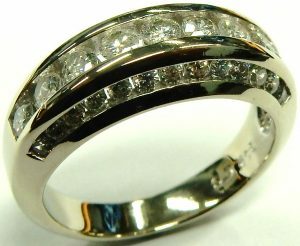 Wedding ring only estate priced at $1497.00 CAD. Stock #e9401. Where do I begin with this diamond ring? 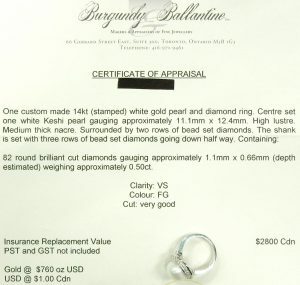 First of all we must be 100% clear; Bill Le Boeuf Jewellers does not support or endorse the appraisal/certificate provided with this diamond ring. The ring has never be used or worn. It still retains its factory applied price tag showing a retail value of over $14,000.00 USD. Everyone’s entitled to an opinion and I guess $14,000.00 is one opinion of value. Given the highly included nature of the diamond, its warmer colour and average cut we feel a more appropriate estimate of retail replacement value would be around $2500.00 CAD. You’d expect to see a range of value for something like this but to have one opinion more than 7 times another makes you wonder what’s going on. We have a different opinion of the described quality too. The numerous inclusions and their affect on transparency place this diamond in the I2 range of clarity. The slight tint of colour the diamond displays warrant a KL colour grade in our opinion. Although the diamond might weigh 1.00 carat, the 6.25mm diameter would suggest a weight closer to 0.94 carat. 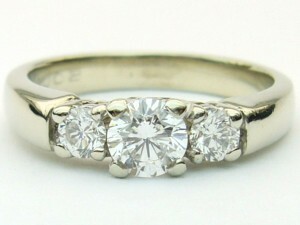 The 3.3 gram 14 karat white gold setting is in perfect condition. The ring is brand new, never worn condition. The factory rhodium plated finish is completely intact and scratch free. While this diamond ring will never be confused with a flawless example it faces up pretty well. 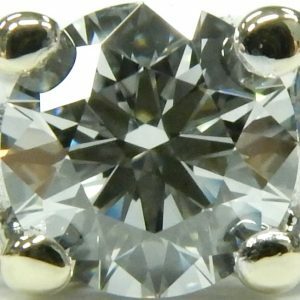 The evenly dispersed inclusions do impact brilliance but the diamond still sparkles. For the estate price of only $1750.00 it represents excellent value. Just don’t fool yourself into believing this ring is worth anywhere near what the original price tag and official looking appraisal say. Our onsite goldsmiths can adjust the size 6 1/2 ring up or down for no charge. The ring comes with the EGL USA Univeral Gemological Services appraisal documents and folder. Estate priced at $1,750.00 CAD. Stock #e11566. Sadly the Polar Bear is not a name brand many people would recognize. Polar Bear diamonds were meant to be the shinning standard in the industry. Their scrupulous focus on diamond quality and ethical behavior were their downfall and the brand eventually succumbed to pressure from lower quality, inferior cut Canadian product faceted offshore. The Polar Bear brand which actually belongs to the North West Territories has gone unused since the company filed for bankruptcy in 2010. We originally carried them when they debuted and we’re always pleased to be able to offer an estate Polar Bear here. 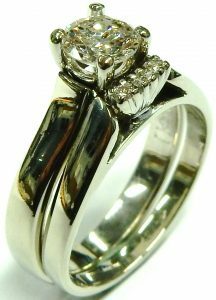 This matching Canadian made by-pass wedding set has been made to appropriately high standards to match the diamond that crowns it. 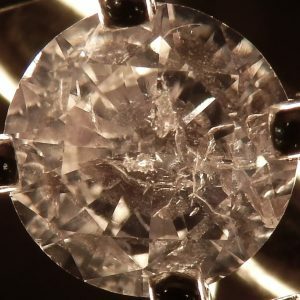 That 0.37 carat round brilliant cut diamond is accompanied by its original paperwork listing an excellent VS1-E quality. The certificate also states the diamond was mined in the winter of 2002 and weighed as a rough crystal 0.85 carat. The diamonds girdle is proudly laser inscribed with a miniature polar bear and serial number. The well made set consists of bright white 14 karat gold and is set with an additional 0.25 carats of petite accent diamonds. The set currently measures a finger size 6 with some room to adjust up or down if needed. Estate price for this piece of Canadian jewellery history is just $1,500.00 CAD for the set. Stock #e11442. If you’ve ever heard someone describing sapphires as having a ‘velvety colour’ this is what they were talking about. As gemologist/jewellers we have a special attraction to exceptional examples of precious stones and this 0.51 carat blue sapphire is truly a treat for the eyes. It ends up looking larger than its 4.87mm in diameter footprint would suggest thanks to the eye catching colour. The sapphire is made even more vibrant contrasting with the 0.18 carats of VS-SI-H round brilliant cut diamonds that softly criss cross the shoulders of the ring. The ring itself weighs 2.8 grams in 14 karat white gold and still retains its original rhodium plated finish. Measuring a finger size 4 1/2 the ring can be sized up or down onsite by one of our goldsmiths. Because sapphires are a symbol of loyalty they were traditionally the stone of engagement before diamonds. 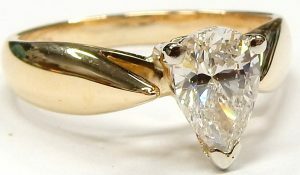 If you have been hunting for a unique and meaningful engagement ring you’ll be hard pressed to find an equal to this ring, especially once you factor in the estate price of just $1,260.00 CAD. Stock #e9788. If you’re looking for one of those rare items in that wear-it-and-forget-it category this diamond ring is for you. Its quality is evident looking at the bulk of the ring and feeling its 4.5 gram heft. The 8 round brilliant cut diamonds that make up its 0.50 carat weight have been deeply and protectively channel set. A good thing too because each is a well cut high quality VS-H, sparkling brightly across the top third of the band. 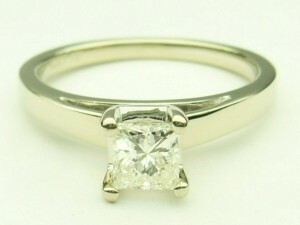 Currently the robust 14 karat white gold ring measures a petite finger size 5 with some room to adjust. Estate price $1,015.00 CAD. Stock #e10998.